Special Guest: My buddy Greg. 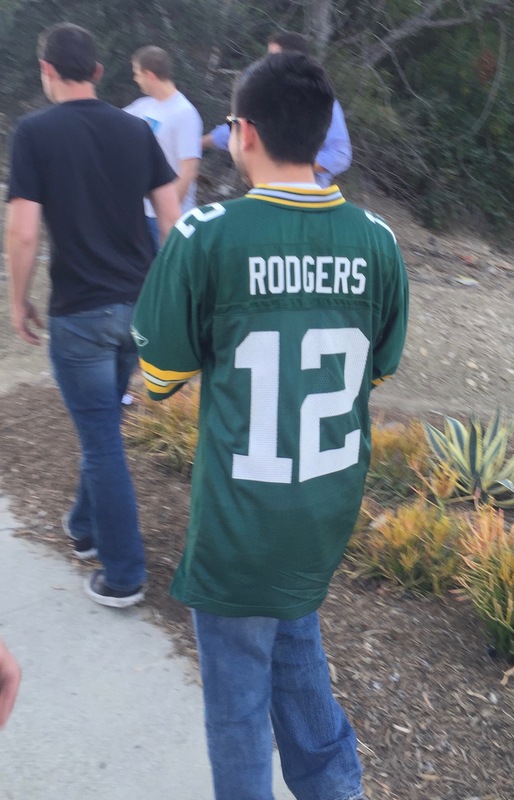 He grew up in Milwaukee but knows who to root for. 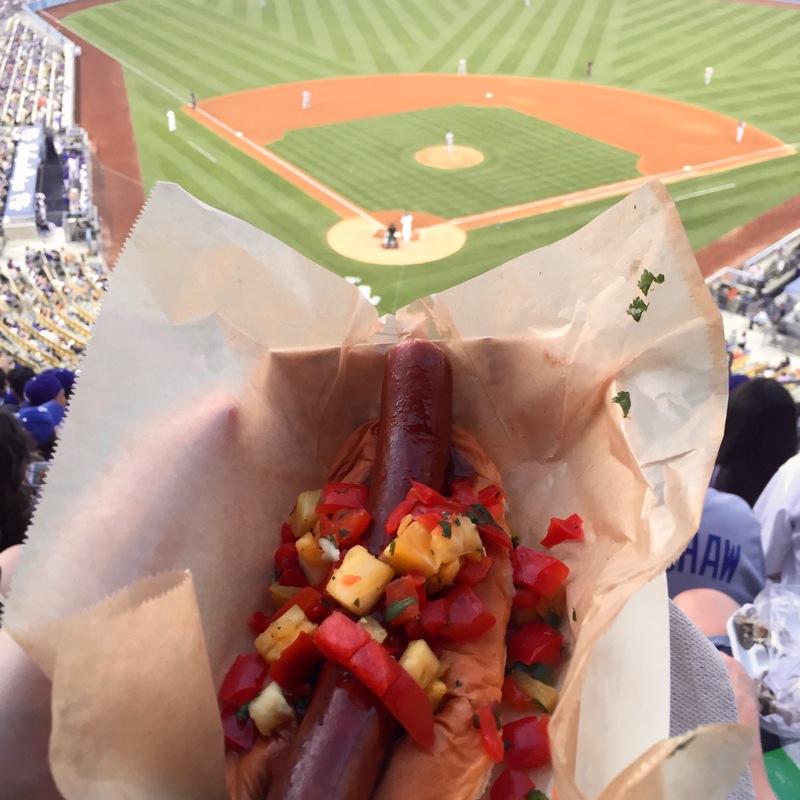 Snacks: Uh, somewhere between the beers and margaritas (I shall decline say how many) there was a Dodger Dog or two. Giveaway: Nope. It was Fireworks Night. Memorable Moment: Getting to hang out with Greg. He’s got a crazy job that has him pretty much circumnavigating the globe every week. Greg and I at our first game together since the original Vin Scully’s bobblehead night in 2012. 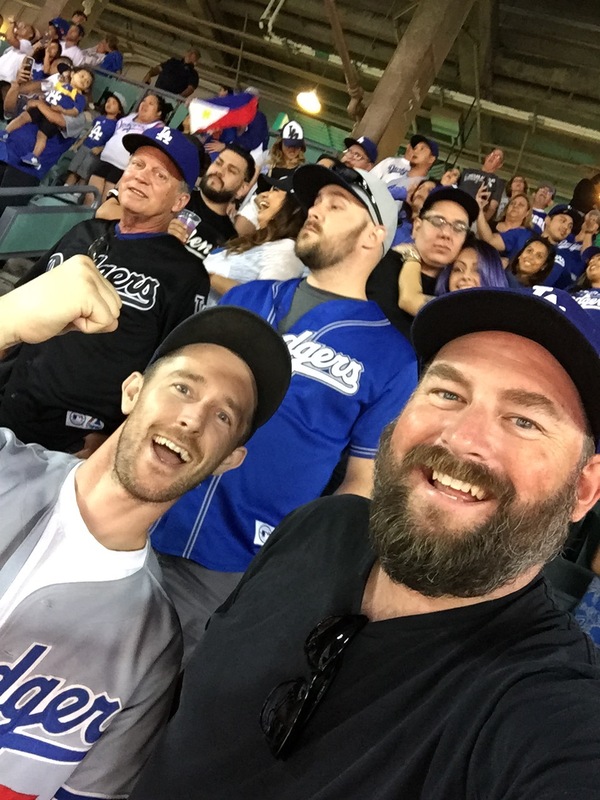 RECAP: It took a few tries (and seasons) but my buddy Greg and I were finally able to make it to a game together AND his hometown Milwaukee Brewers happened to be the Dodgers’ opponent. 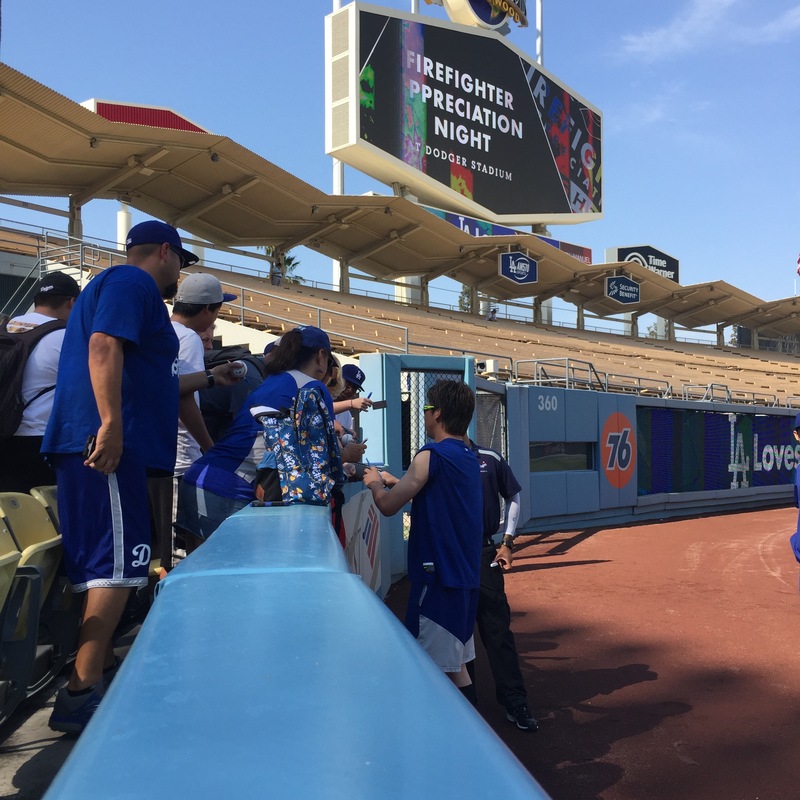 We met up at The Short Stop to pregame with some tall boys before making the walk over the hill to Dodger Stadium. 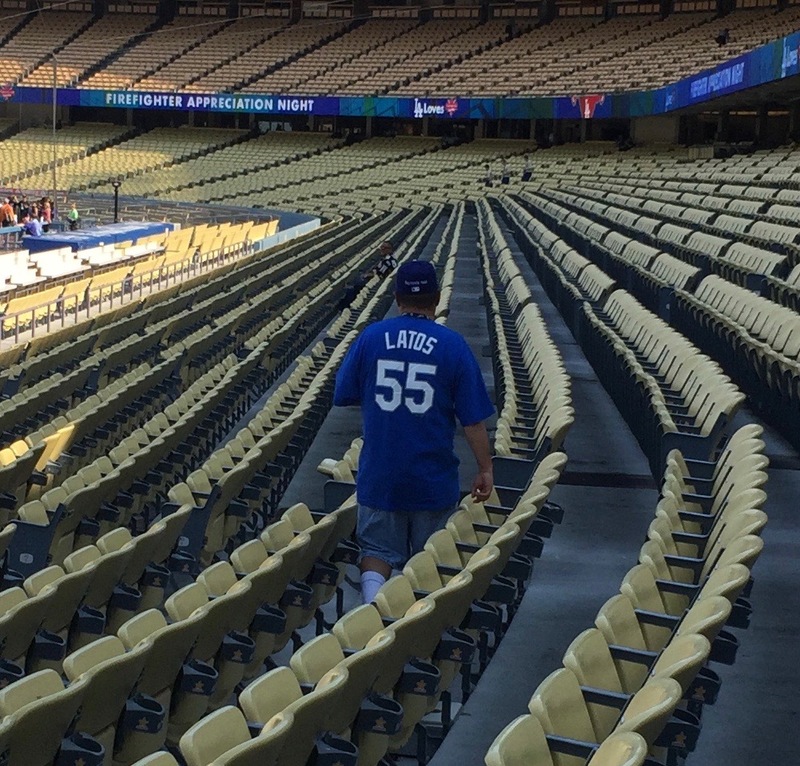 One of the first people we saw when we staggered onto Vin Scully Ave was this guy. But where’s the cheese head? 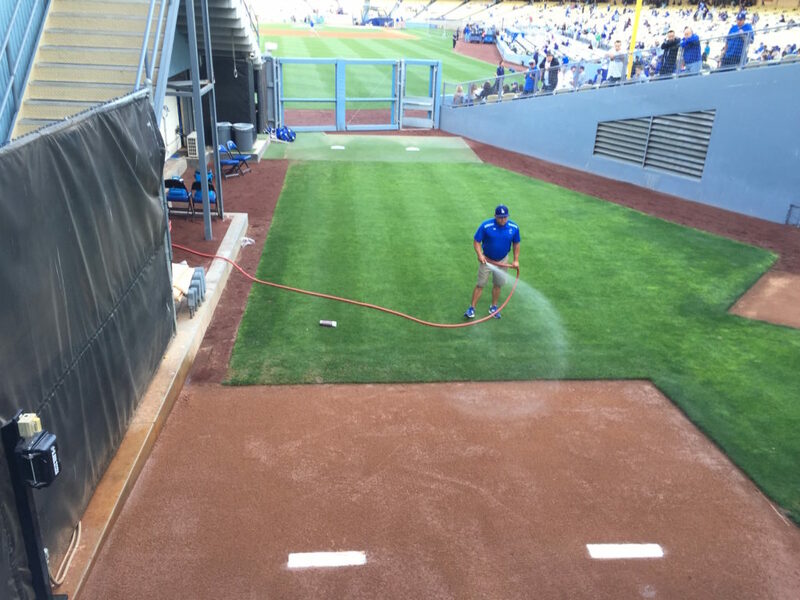 Julio Urias made his second career Dodger Stadium start and was lights out. Justin Turner gave him a 1-0 lead with solo shot in the bottom of the first and the kid made it last for five innings on a mostly efficient 85 pitches. 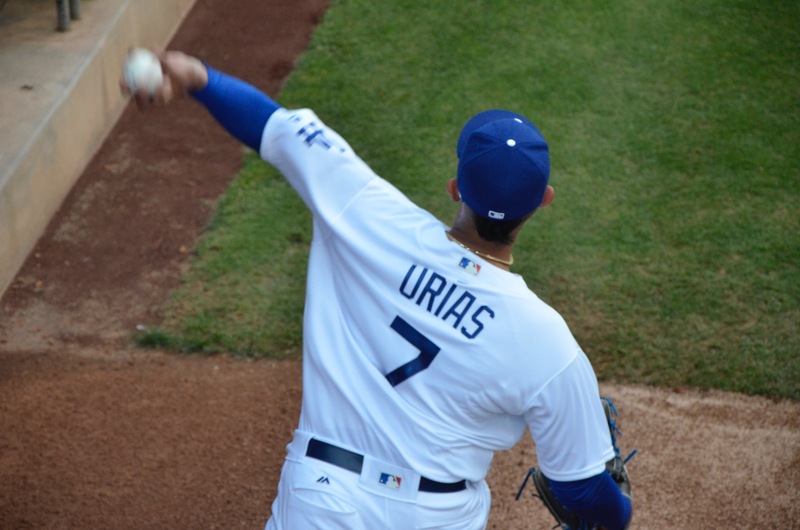 Then, out of fear his arm would fall off if he threw an 86th pitch, Urias was pulled in the top of the sixth for Louis Coleman. 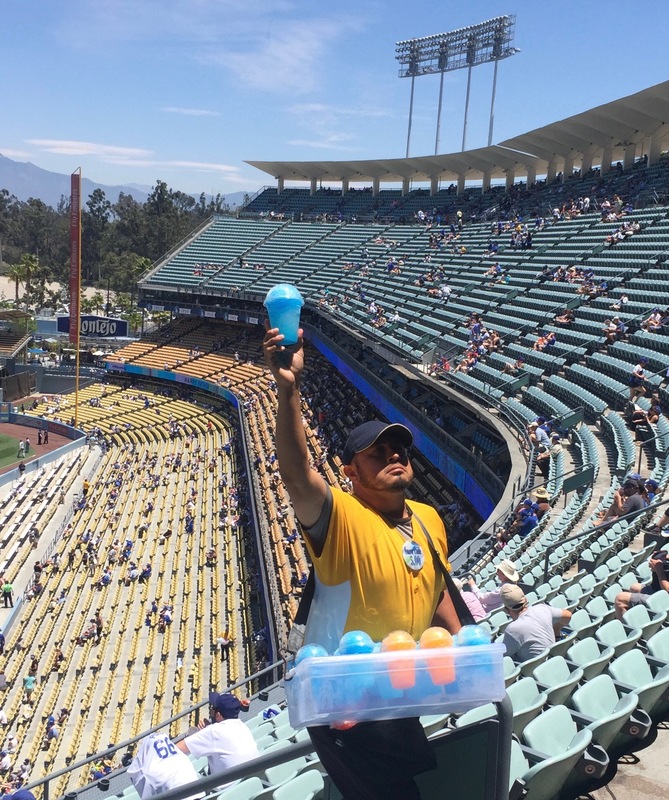 Four batters (and one Adam Liberatore appearance) later, the Brewers took a 2-1 lead and erased any chance of Urias getting his first career win. As things were looking extra dire for the Dodgers, Greg dropped some absolutely mind blowing trivia on me. 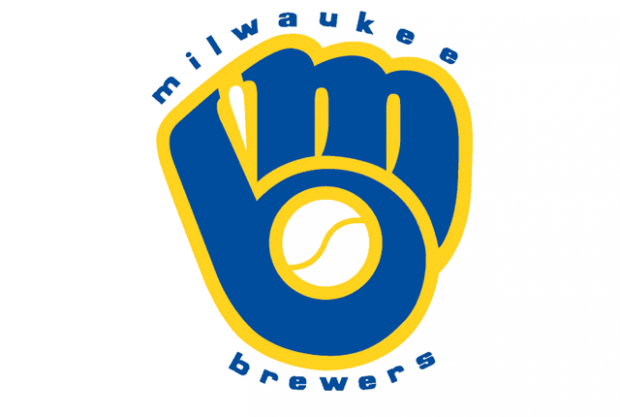 The Milwaukee Brewers’ classic logo features a hidden ‘m’ and ‘b’. Call me slow on the uptake, but I never realized that. Now it’s as plain as day. See the M and the B in the mitt? 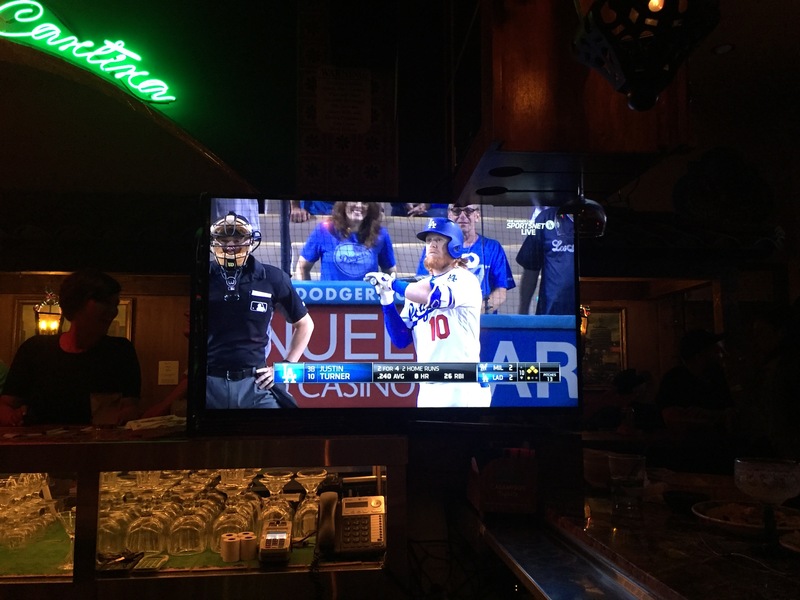 Luckily for the Dodgers, that Justin Turner fellow went up to bat in the bottom of the eighth and launched a 1-2 pitch into the Dodger bullpen to tie the game. Suddenly faced with the prospect of a game going into extras, Greg and I made the executive decision to call it a night. He’d been up since the wee hours of the morning to fly back to LA and was fading. Luckily for us, he found a second wind as we walked by El Compadre and ducked in to watch the game and have another drink or three. 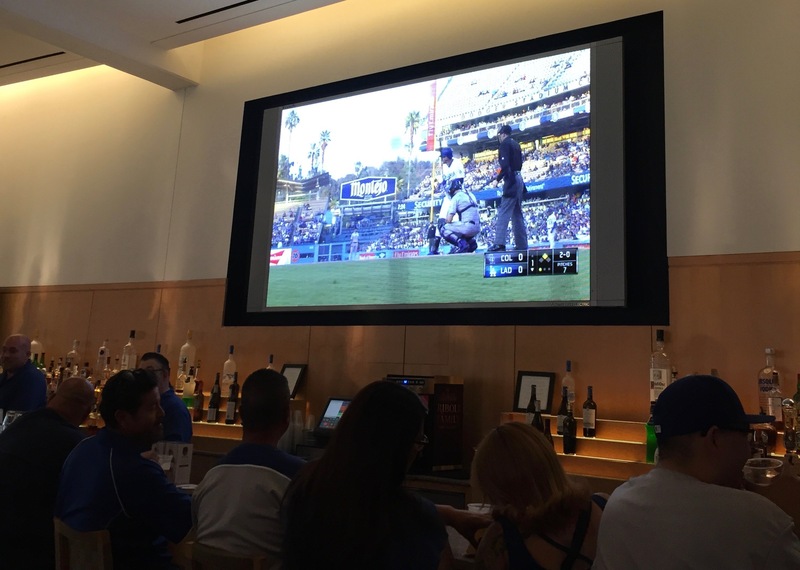 It was my first time there and was pleasantly surprised to see it was pretty much a Dodger sports bar. In all my years of living in LA, I never knew such a thing existed. 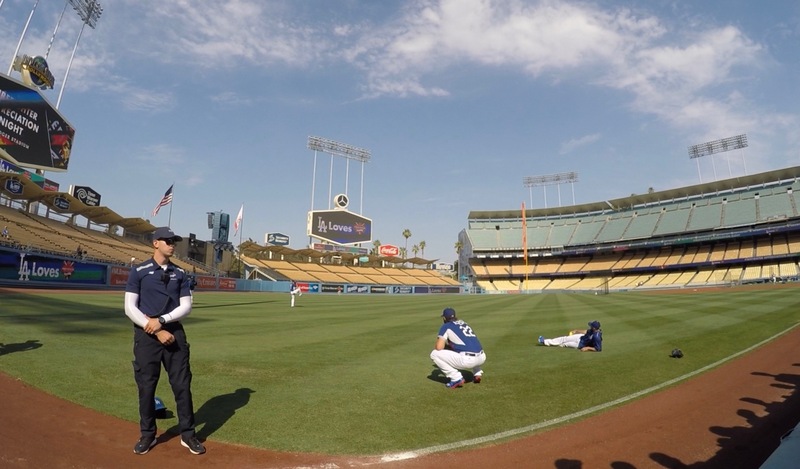 After watching Pedro Baez semi-miraculously hold Milwaukee scoreless in the top of the tenth, the Dodgers got right to work in their half of the inning. Will Venable hit a ground-rule double and was moved over to third on a sacrifice bunt by A.J. Ellis. Faced with a runner on third and only one out, Brewers manager Craig Counsell did the totally logical thing and intentionally walked the next two batters to bring up Turner with the bases loaded. 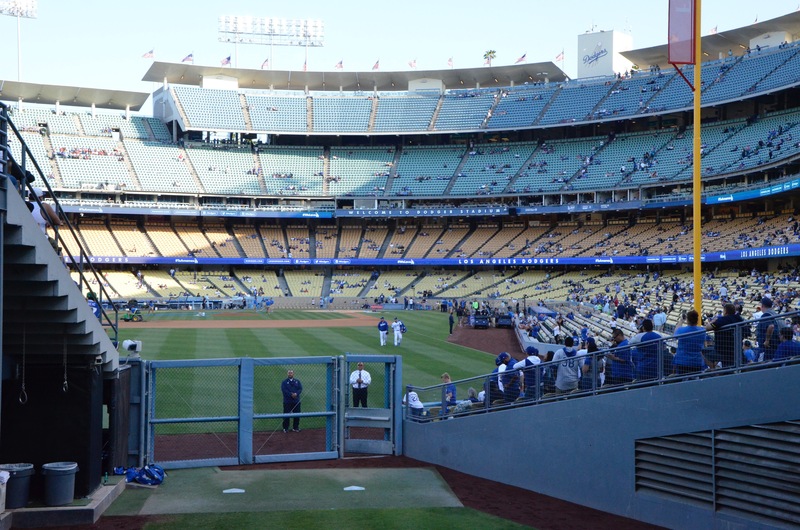 The fans behind home plate are smiling because they know what Turner is about to do. Turner didn’t let an 0-2 count scare him and lined the game winning hit into center field and sent high fives flying around El Compadre. To the best of my knowledge, this was my first-ever walkout walk-off. Finally, tonight’s Obscure Jersey of the Night Award goes to Greg. 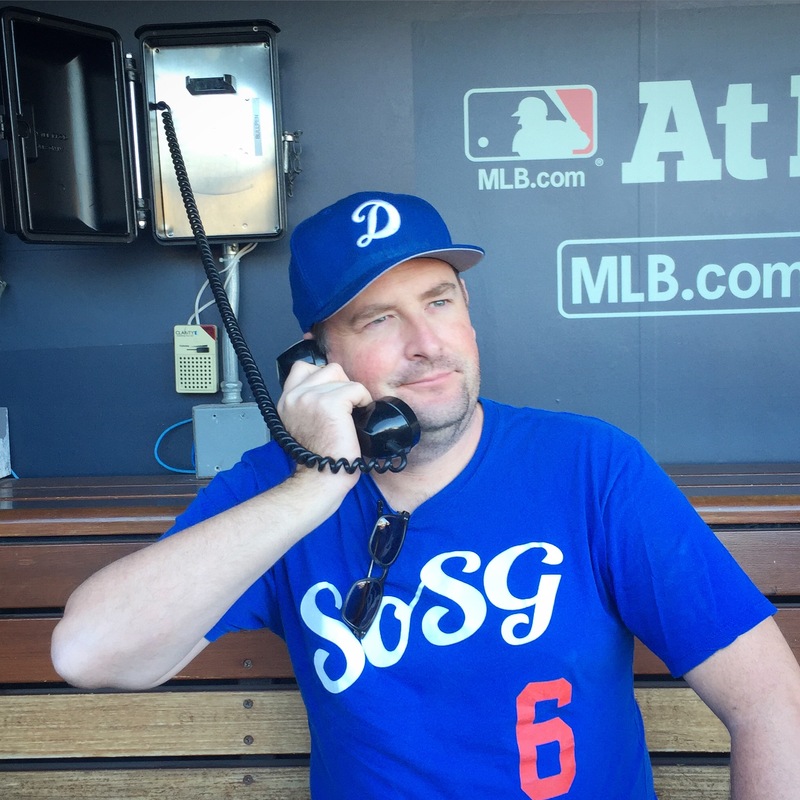 Greg said he found this Dodger jersey in his boss’ storage unit. 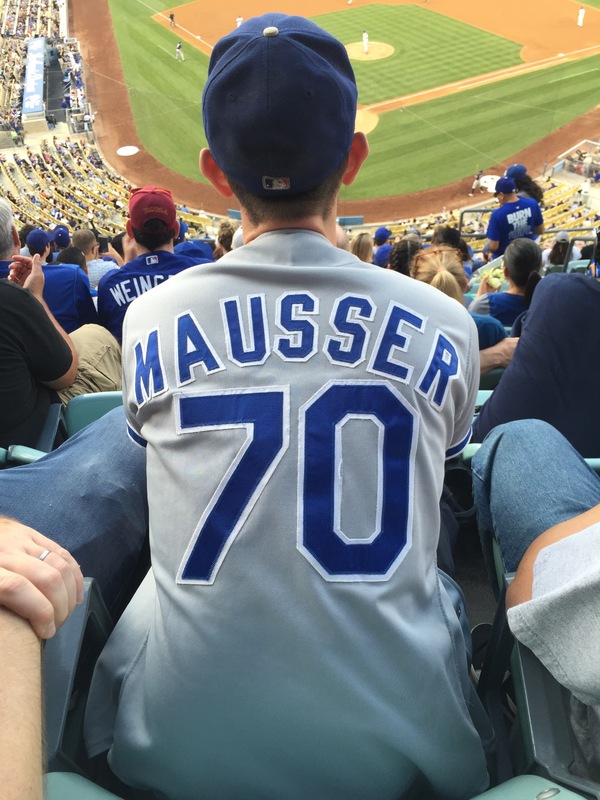 I have no idea who Mausser is and neither does Greg. Special Guest: My friend Meg. Snacks: Bud Heavy (x3!) Nacho Helmet. Boom. Giveaway: Duke Snider retired number pin. 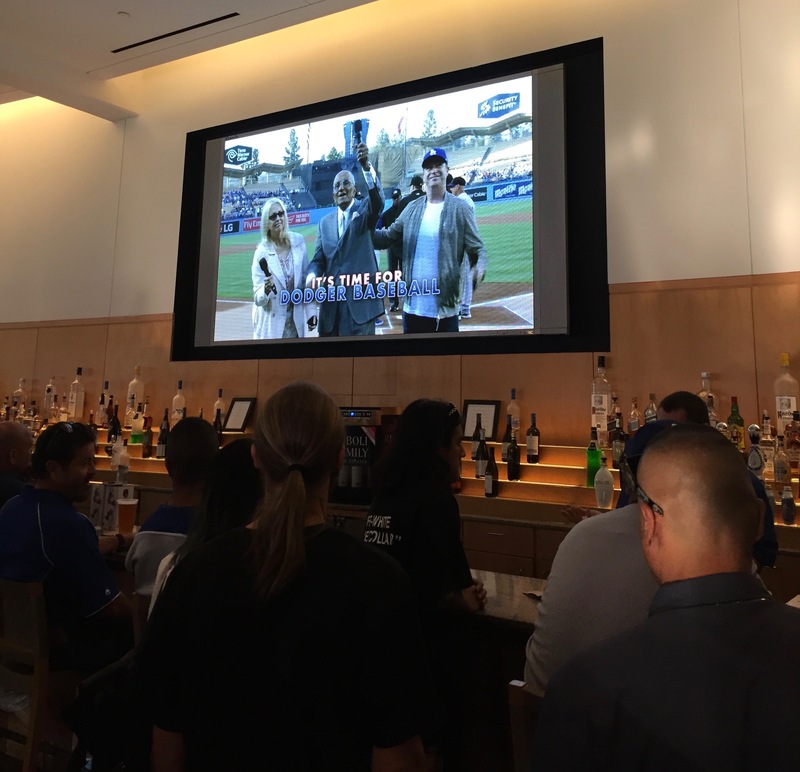 Memorable Moment: Trayce Thompson’s three run homer is the lone standout among all the moments Dodger fans would like to forget. Taking it out to the ballgame with my friend Meg. Adding to the miscues on the night was the t-shirt I chose to wear. The Dodgers have never won when I wear this shirt. I thought tonight might finally be the night but no dice. Sorry, KISS. This bad boy is going to Goodwill. Recap: Let’s start with a quiz. Which of these bizarre occurrences happened during this game? A: Clayton Kershaw pinch ran for A.J. Ellis in the bottom of the ninth with two outs. B: Yasmani Grandal was a nanosecond away from erasing a game tying sac fly by trying to tag up from first to second. 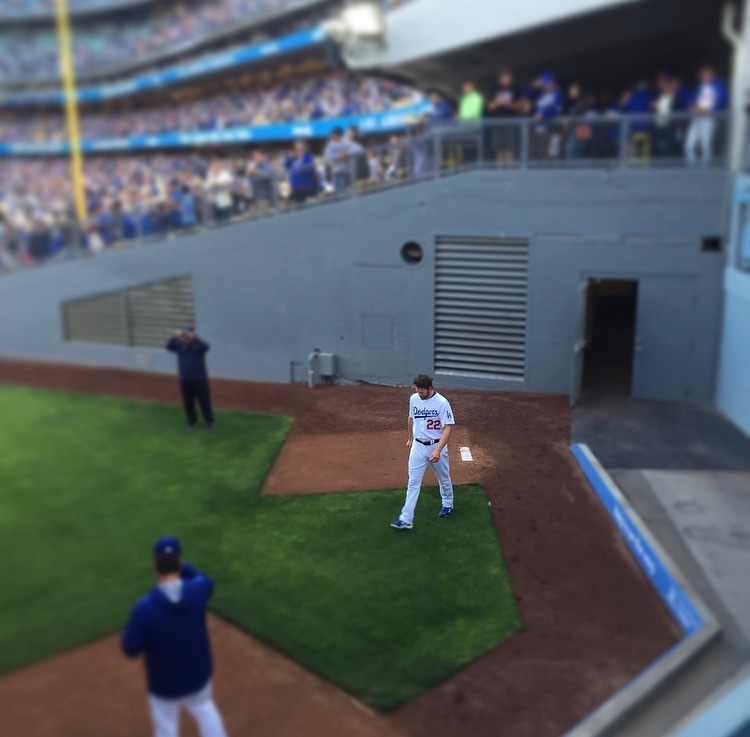 D: Kenley Jansen warmed up but didn’t enter the game with the score tied in the ninth inning. F: All of the Above. If you said ‘F’, congratulations. You guessed correctly. 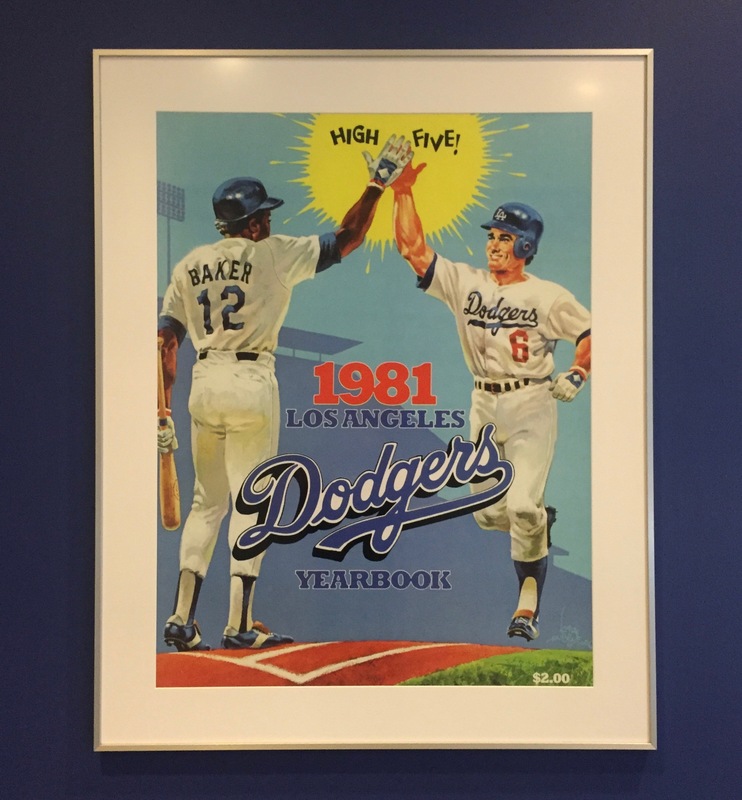 And as fate would have it, an F is a more than fair grade for how the Dodgers played and were managed. This game was filled with more bad decisions than a car load of Kardashians. Perhaps the craziest one of all was Dave Roberts’ decision to put Clayton into the game as a pinch runner for A.J. in the ninth. After A.J. notched a pinch hit single, my friend Marc and I speculated about who could possibly pinch run for A.J. 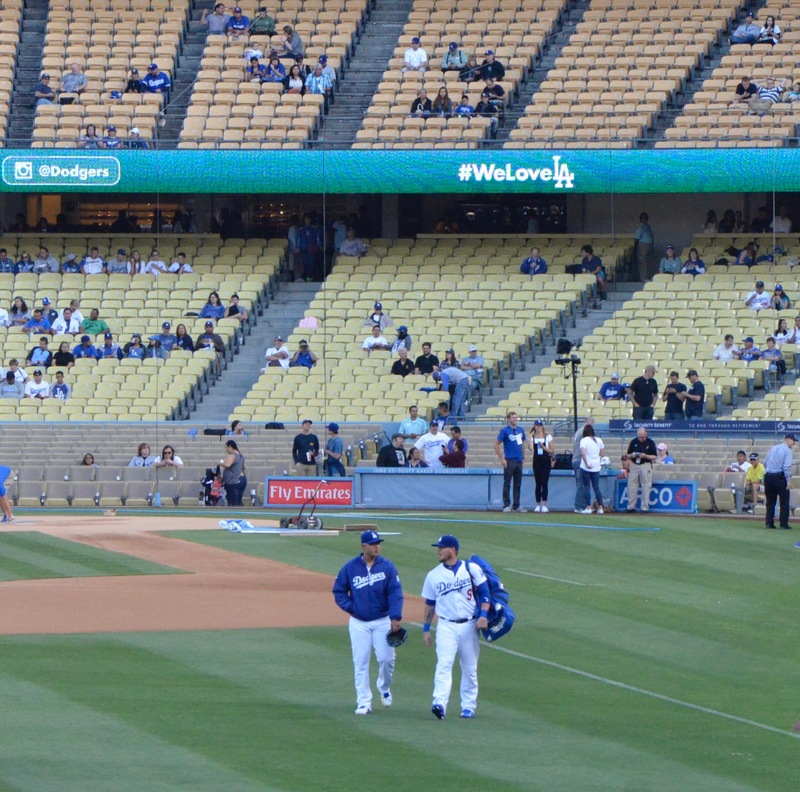 Thanks to Scott Kazmir throwing 10,000 pitches by the fourth inning, the Dodger bench was long depleted. 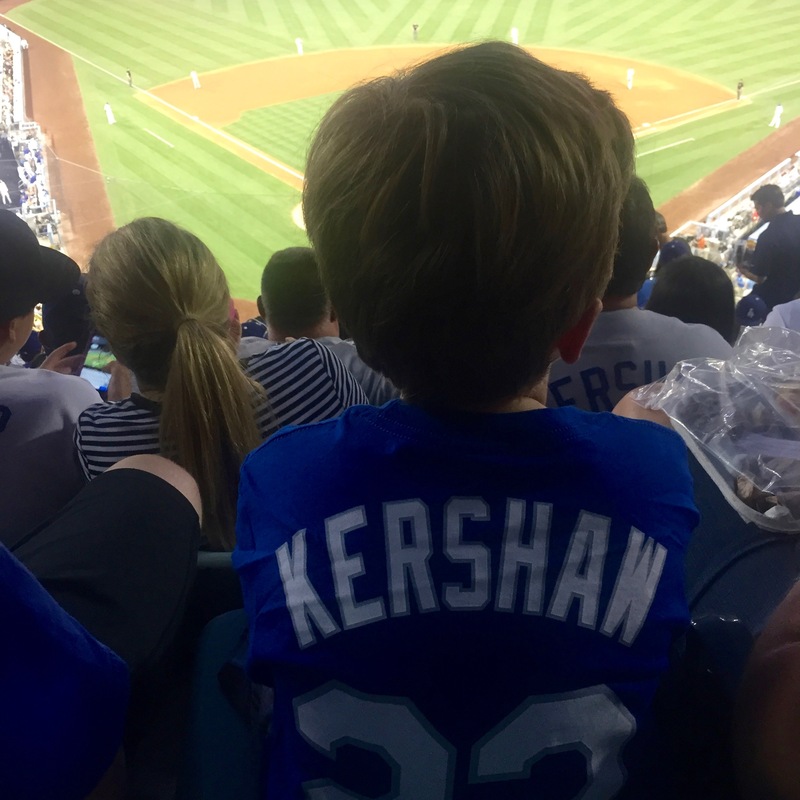 Kershaw was the only player left who made the slightest shred of sense on the basis that he might be half a step faster than A.J. but putting him into a situation where he might be involved in a gnarly play at the plate with the game on the line? He’s a gamer and all but man, that’s a season wrecking disaster waiting to happen. In better news, though, Trayce Thompson continued his tear with a three run shot and back-to-back errors by Brewer center fielder Keon Braxton made for a nice blast of hilarity and gave Dodger fans plenty of optimism that the Boys in Blue would be getting that W.
Just an inning earlier, the situation was so dire, fans resorted to looking at underpants for entertainment. See, look. Dodger boxer shorts. Free to the first 40,000 fans this Father’s Day. 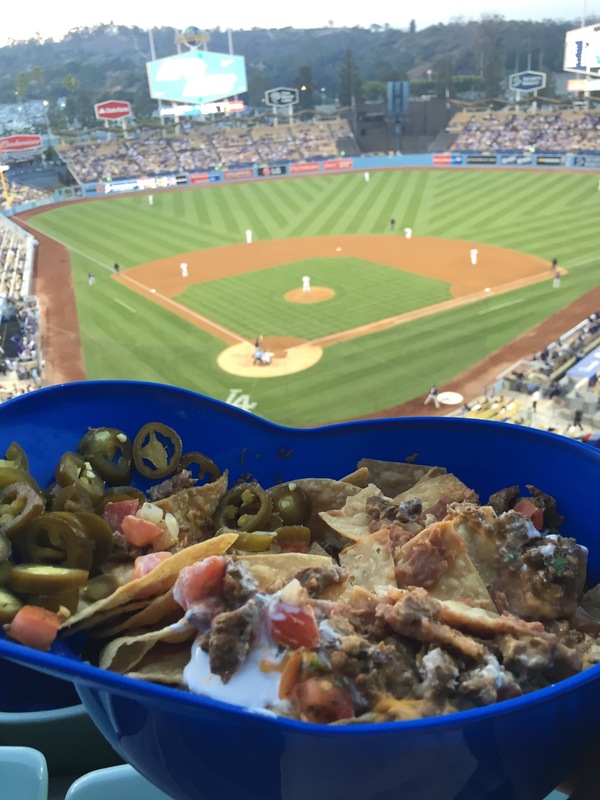 Despite the outcome, it’s never a bad night when you can drink some beers and eat 12lbs of nachos out of a novelty helmet. Plus, random, non-giveaway weeknight games can be the best because the fans who do show up are the ones who really want to be there. This was the crowd that stuck around for the bottom of the ninth and we were just as loud as a full stadium. 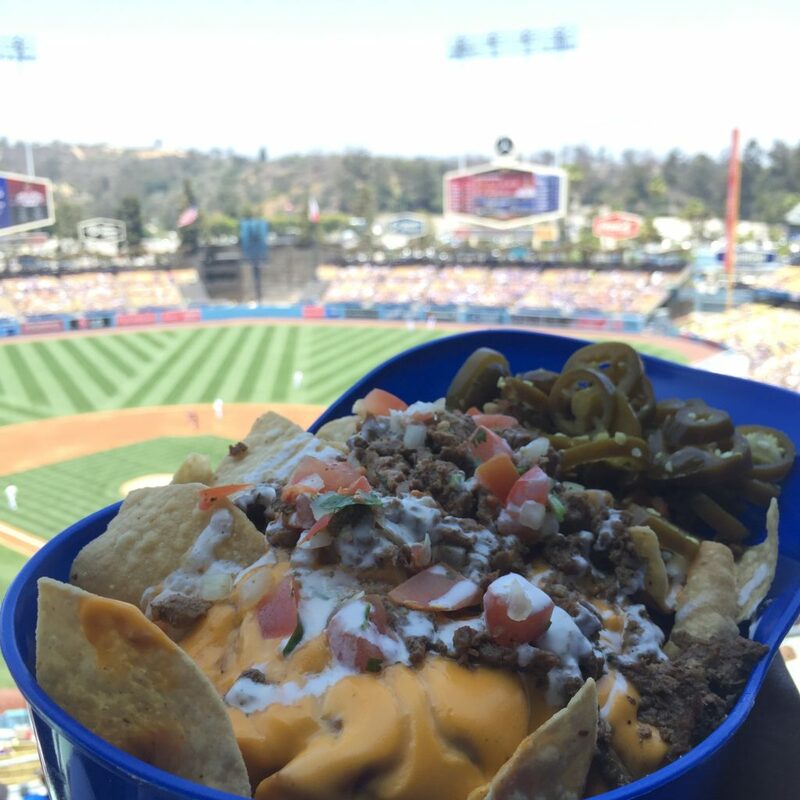 Obligatory Nacho Helmet glamor shot. Finally, here’s a brand new feature: The Obscure Jersey of the Night Award. This evening’s winner belonged to a JD Drew fan. JD Drew in the house. Snacks: Stella (thanks, Marc! 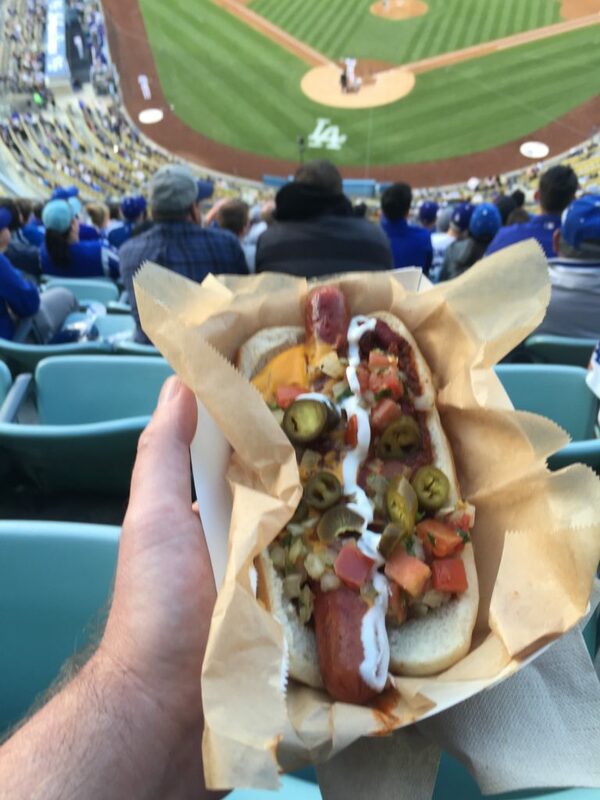 ), Dodger Dog (x2). 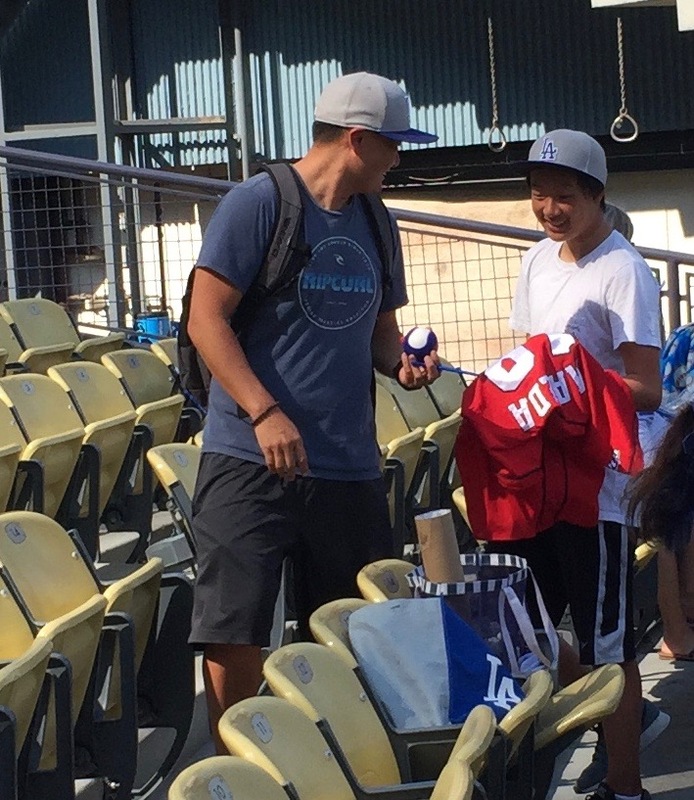 Giveaway: Today’s gift was seeing Julio Urias make his Dodger Stadium debut. Memorable Moment: About the only thing that could top seeing Urias’ debut would be a walk-off home run and that’s exactly what we got. Thanks, Trayce! 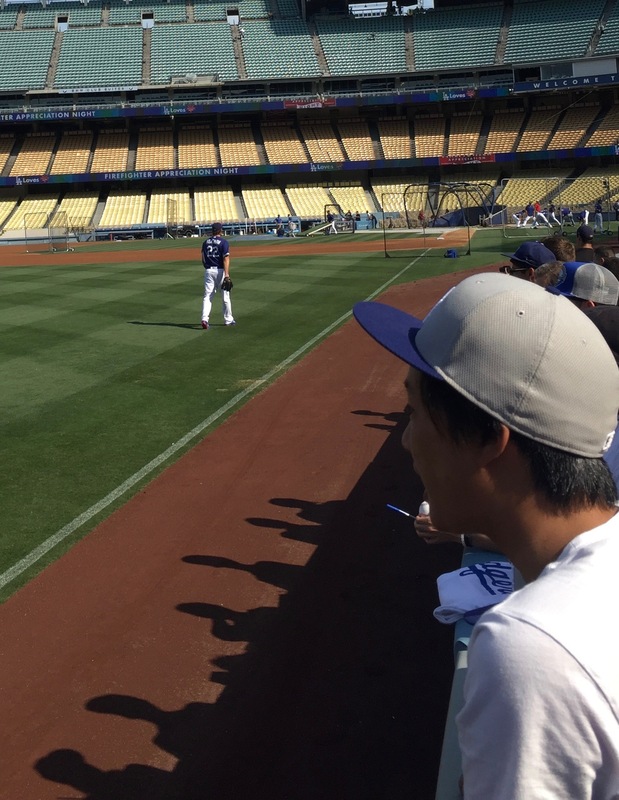 RECAP: All eyes were on Julio Urias for this one but those who arrived early were treated to getting to watch Clayton Kershaw go through his bullpen session. 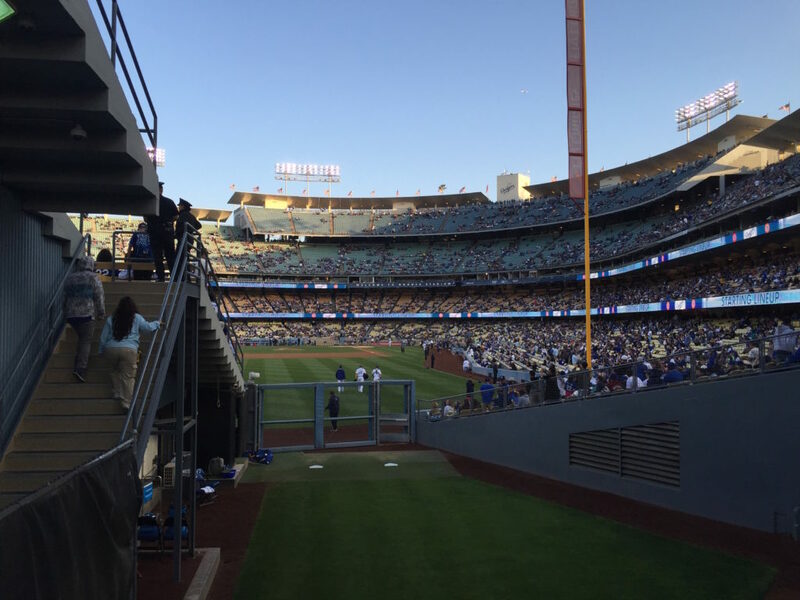 As I entered the stadium, a heavy thump was emanating from the Dodger bullpen. A dozen more steps and that thump began to sound all-too-familiar. This was the scene when I joined my friends Marc and Leslie at the Bullpen Overlook. 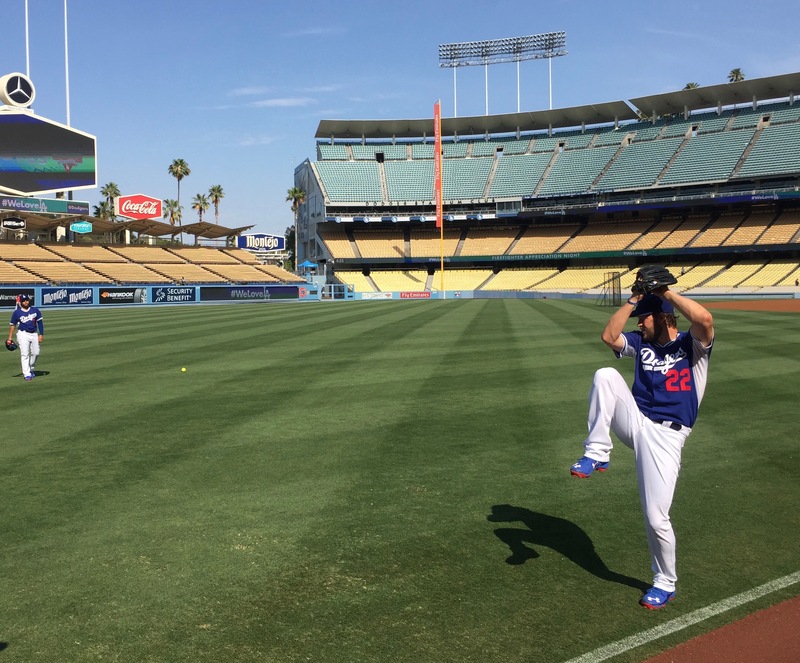 Clayton Kershaw works out in the bullpen in anticipation for Friday night’s showdown with Johnny Cueto in San Francisco. Well hello there, Mr. Cy Young/MVP winner. Must have been a good workout if A.J. led with a fist bump from so far away. Clayton and A.J. 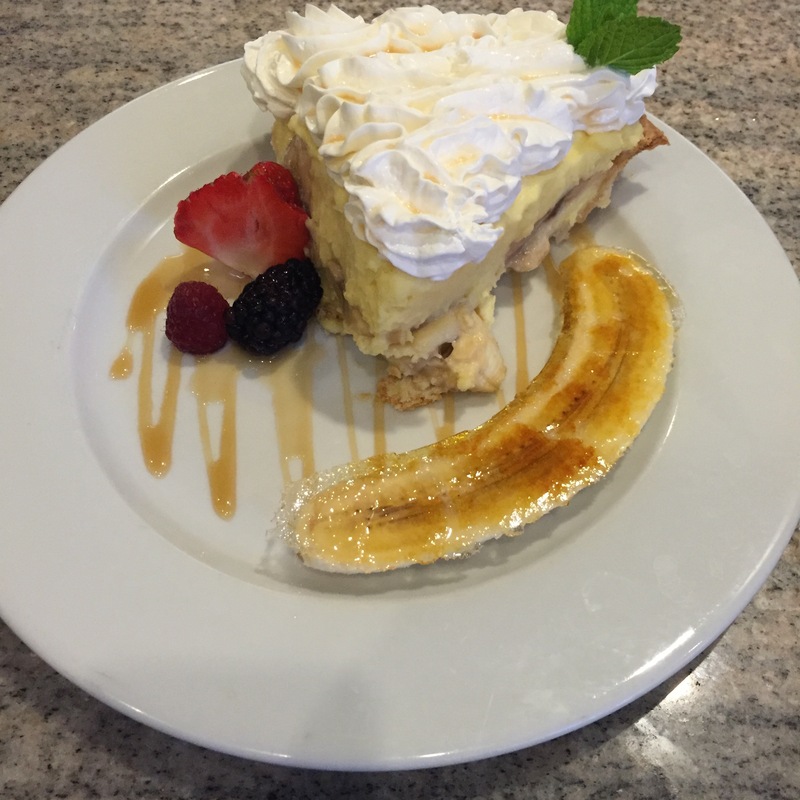 getting a head start on Best Friends Day. 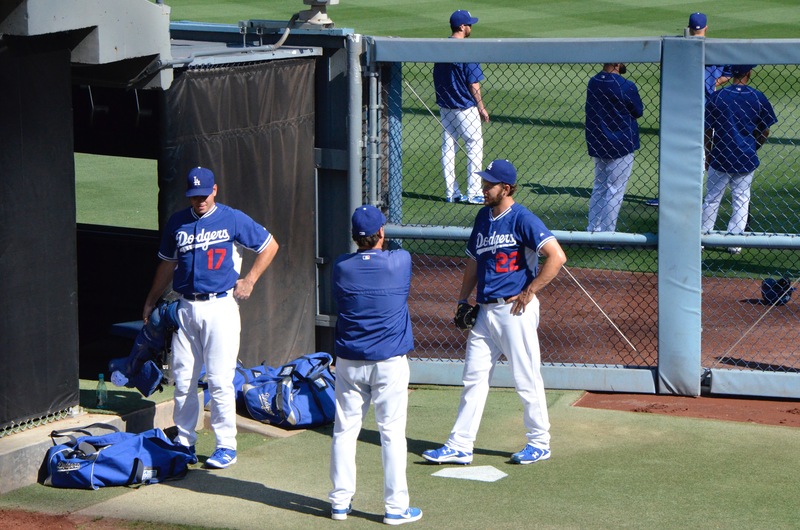 Either they’re making plans for dinner or Clayton is busting A.J.’s chops about something. 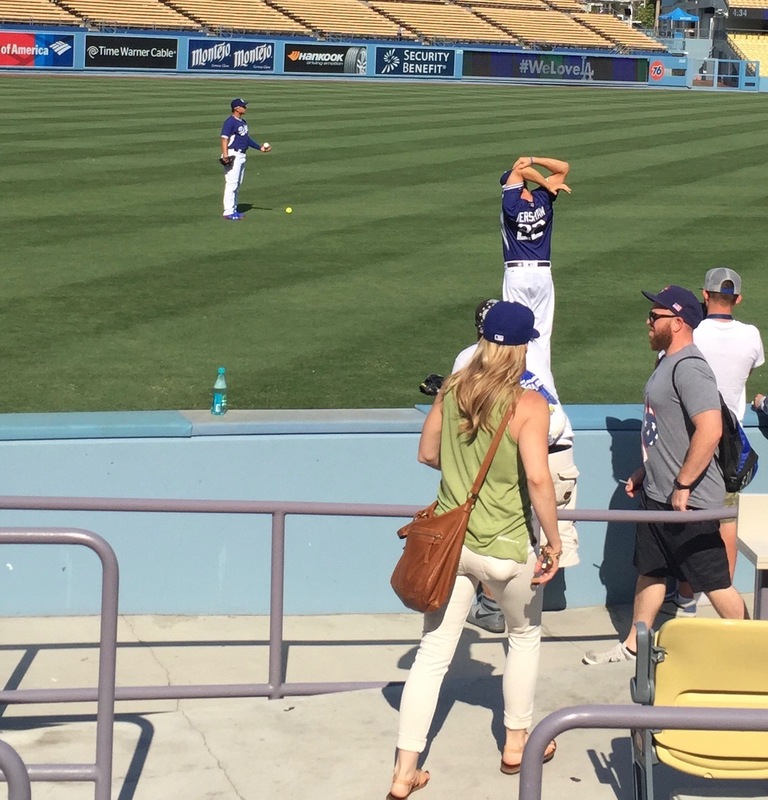 Once Kershaw wrapped up his workout, the Bullpen Overlook cleared out for all five minutes. 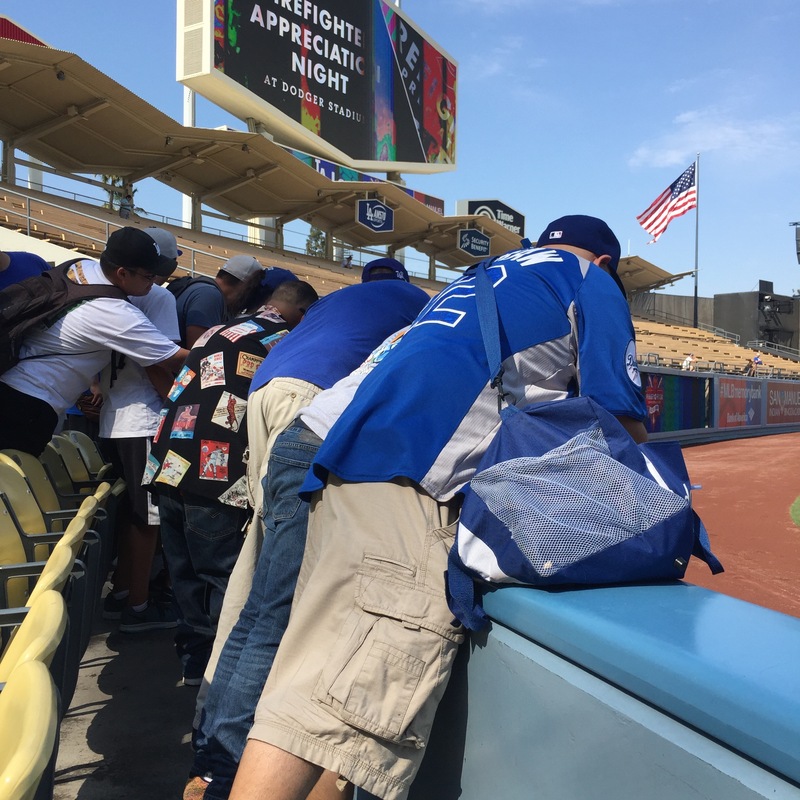 Fans entering the stadium wasted no time in staking out spots to wait for the arrival of Urias and my buddy Johnny soon joined us. 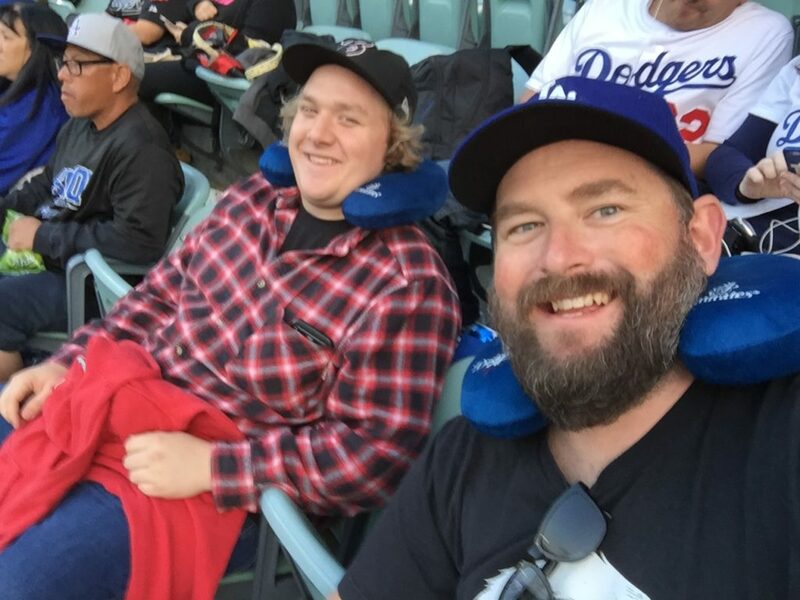 He’s a Yankee fan for life but is appreciative of the Dodgers’ efforts so he’s always a good time at a game. 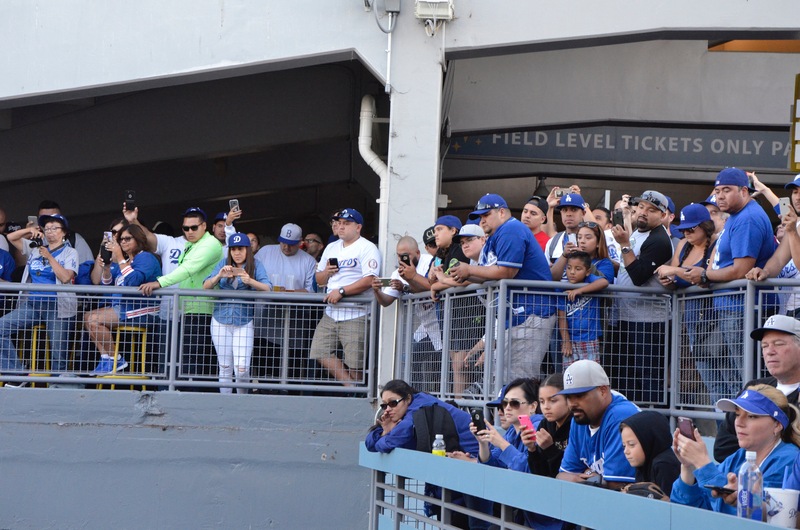 This was the swarm around the bullpen an hour before game time. Then it happened. 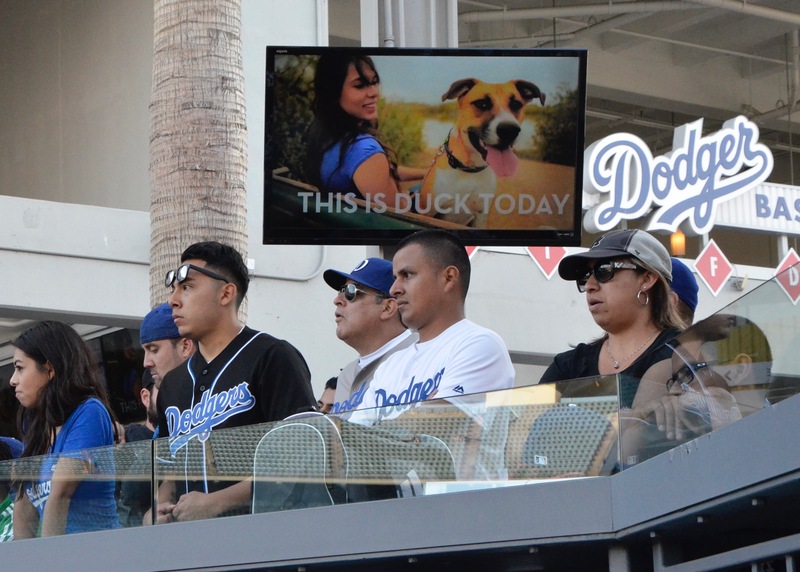 Fans’ expressions went from bored to OMG faster than Maury Wills running the bases. 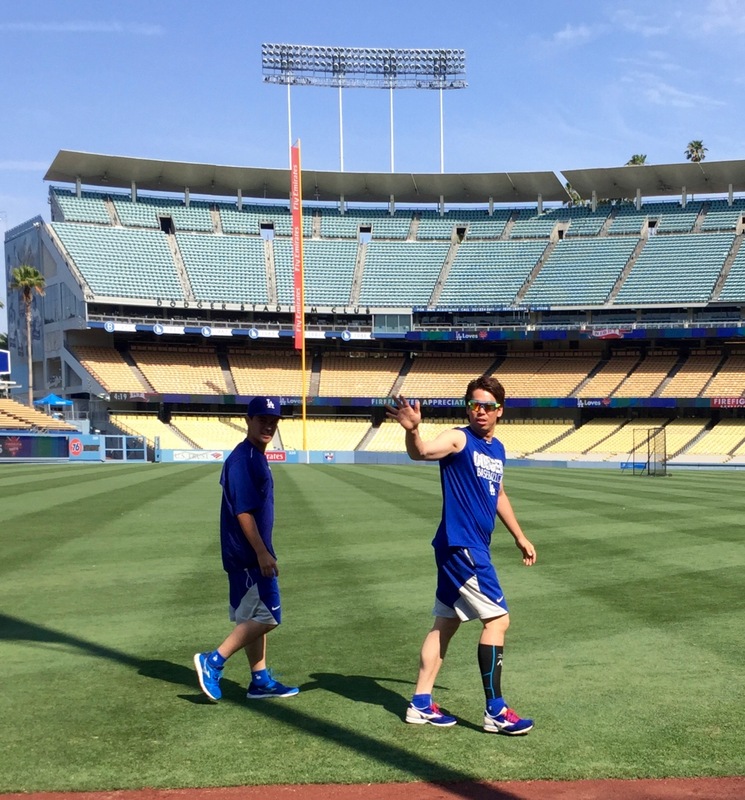 That moment when a 19-year-old phenom walks onto the field. 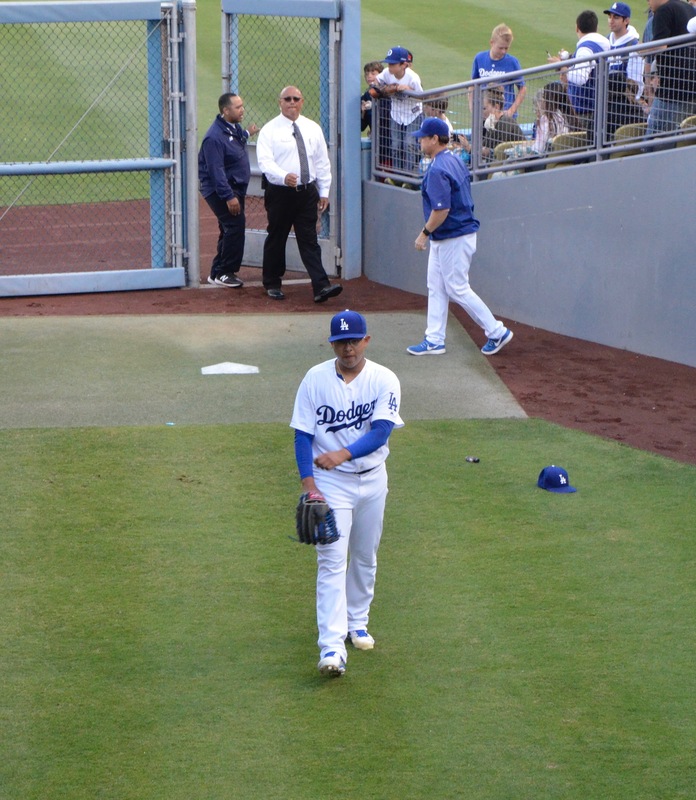 Julio Urias and Yasmani Grandal make the walk to the Dodger bullpen. No pressure, kid. No pressure. 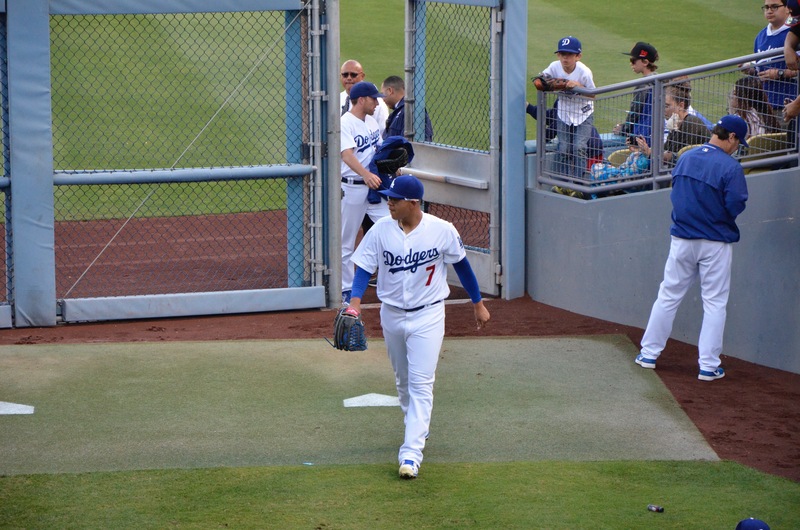 Urias heads to the bullpen mound. El brazo de oro. He’s gonna be a good one. 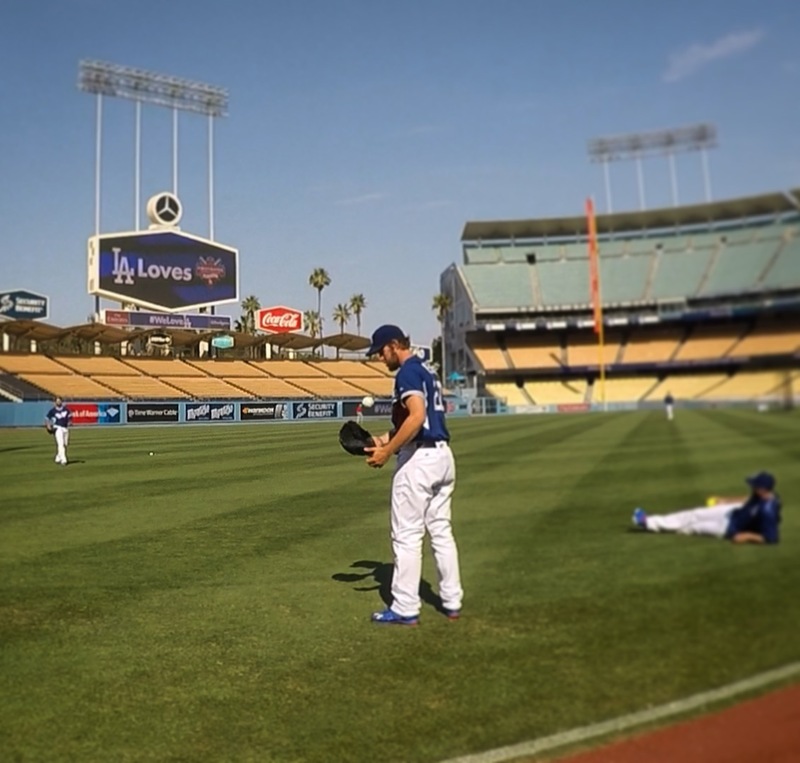 If photos of Urias aren’t doing it for you, here’s a video that I shot because I’m the kind of nerd who just had to bring along three cameras. 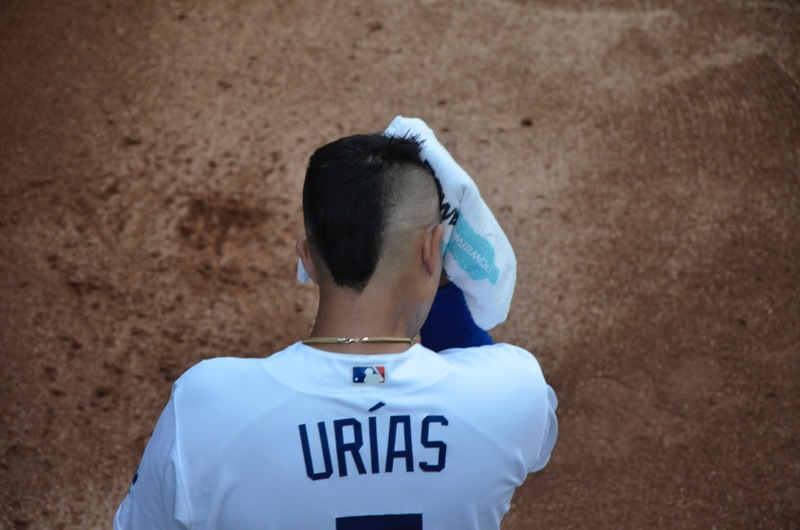 Time for Urias to go to work. 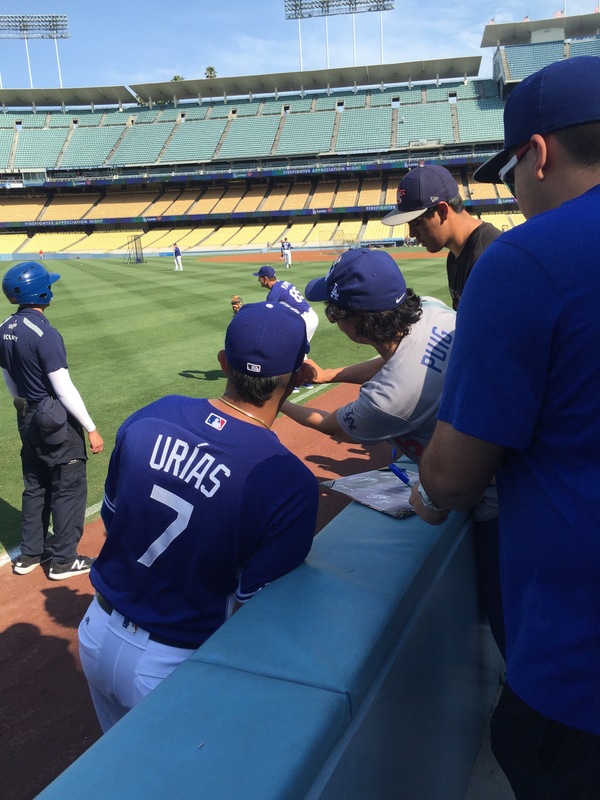 Once on the mound, the third time was the charm for Urias. 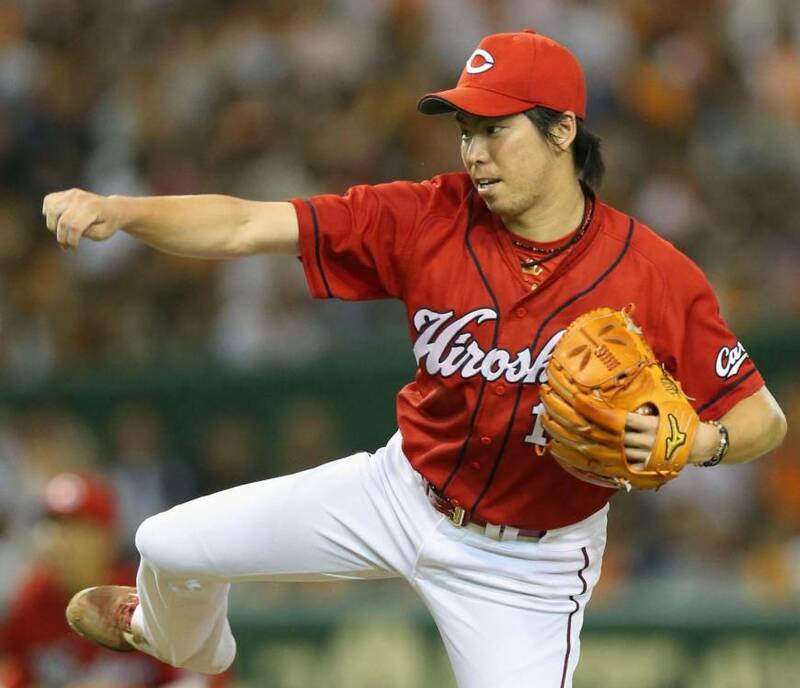 He may have only went four innings on 86 pitches but he gave up just one run on three hits and struck out seven of the 17 Rockies he faced. Following a slightly tense (sorry, won’t describe it as rocky) first inning, Justin Turner got the Dodgers on the board and helped my fantasy team with a three run shot that gave Urias his first lead of his young career and it seemed to settle him down in the following innings. A big positive is that he didn’t unravel when Nolan Arenado doubled home DJ LeMahieu in the third. He promptly erased that threat by striking out some Carlos Gonzalez fellow to end the inning. 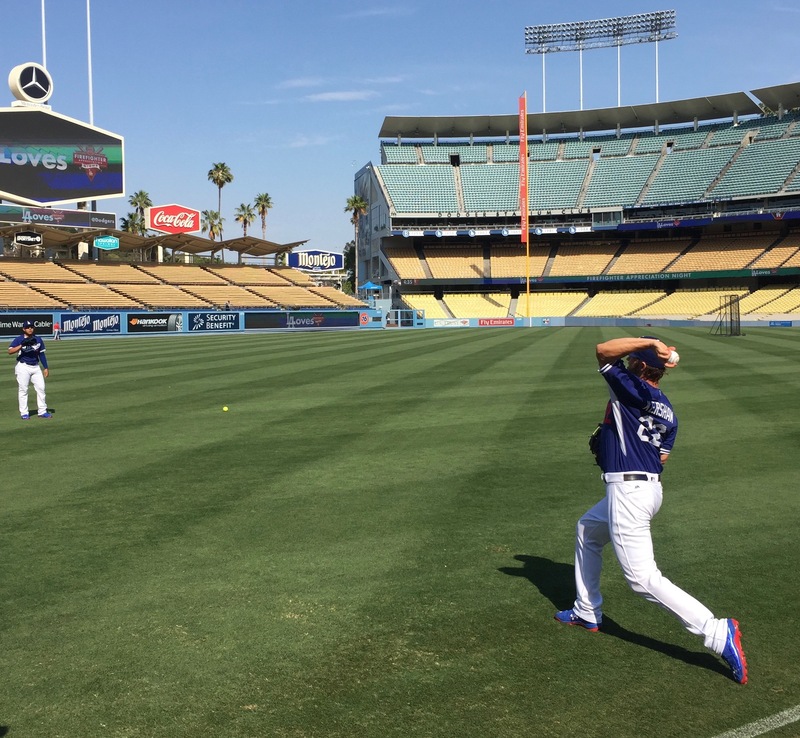 After years of anticipation, Julio Urias made it to the big club. 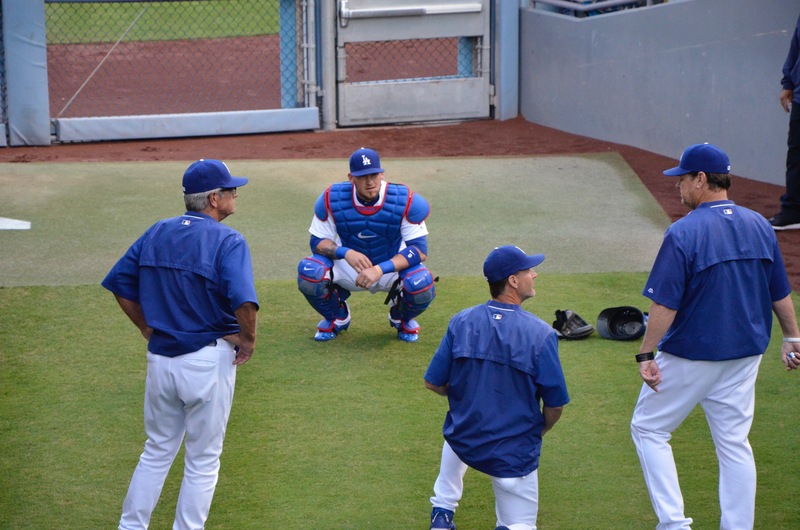 The Dodger bullpen was another story. After Louis Coleman and Adam Liberatore combined forces to hold down the fort for an inning, Joe Blanton and Pedro Baez got the Rockies back into the game. With the score tied at three with two outs in the bottom of the ninth, Rockies manager Walt Weiss called on Carlos Estevez to face Trayce Thompson. As Estevez threw his warmup pitches, our conversation shifted to how many extra innings we’d be willing to sit through on a Tuesday night. Two pitches later we were jumping out of our seats as Thompson hit a line drive just over the left center field wall. 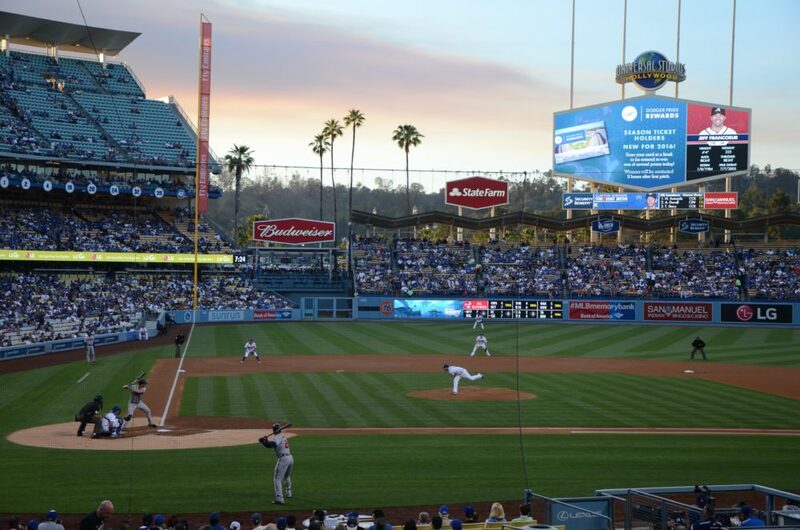 It was a great night to be at Dodger Stadium. Special Guest: My friend Jihane. 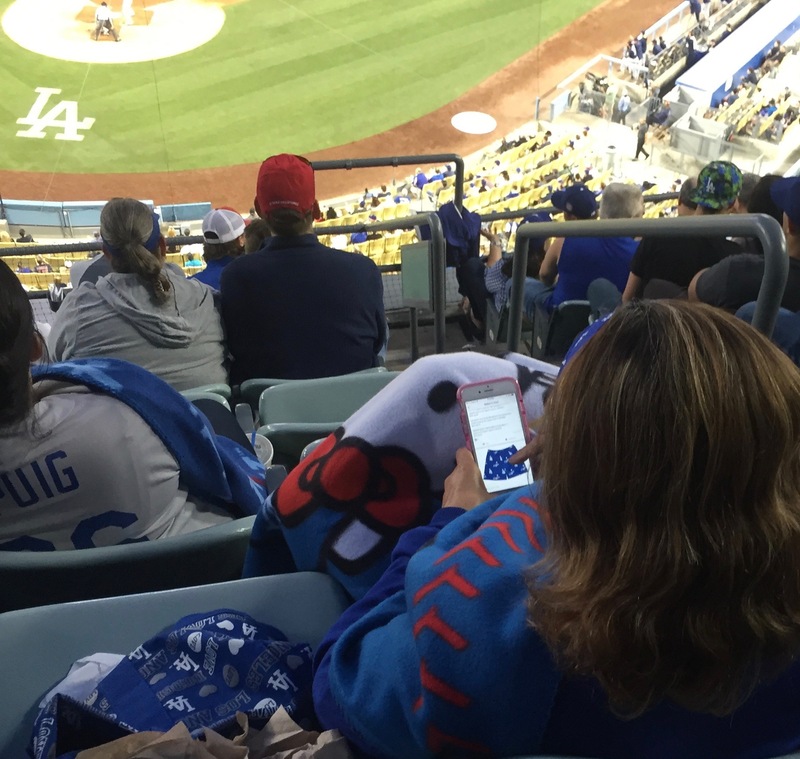 This was her FIRST Dodger game. Snacks: Nacho Helmet AND an Ice Cream Helmet. 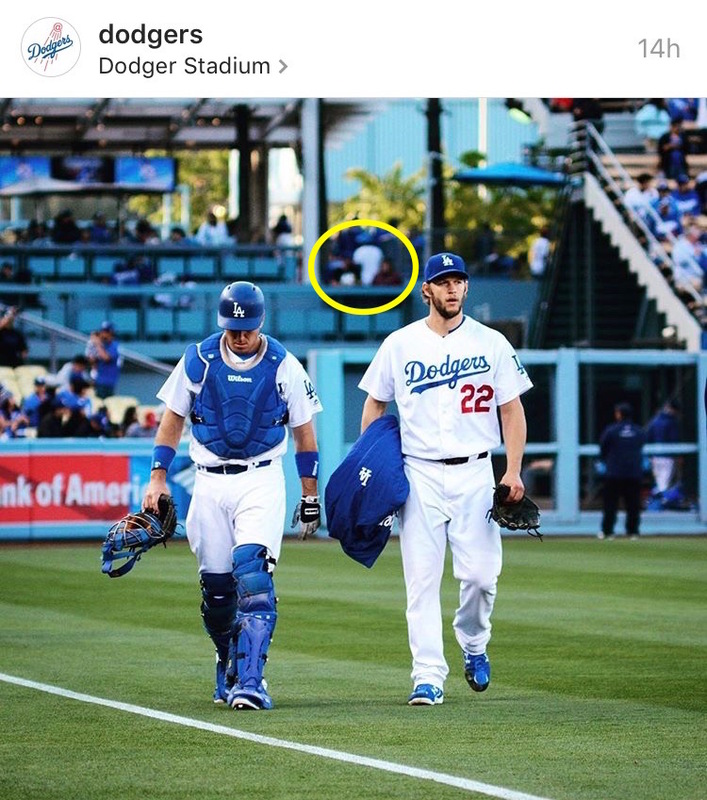 Memorable Moment: Corey Seager becoming known as “the guy who hits home runs” according to Jihane. Help me out, #Dodgers fam. RECAP: This was a game of many firsts. My first Sunday day game of the season. 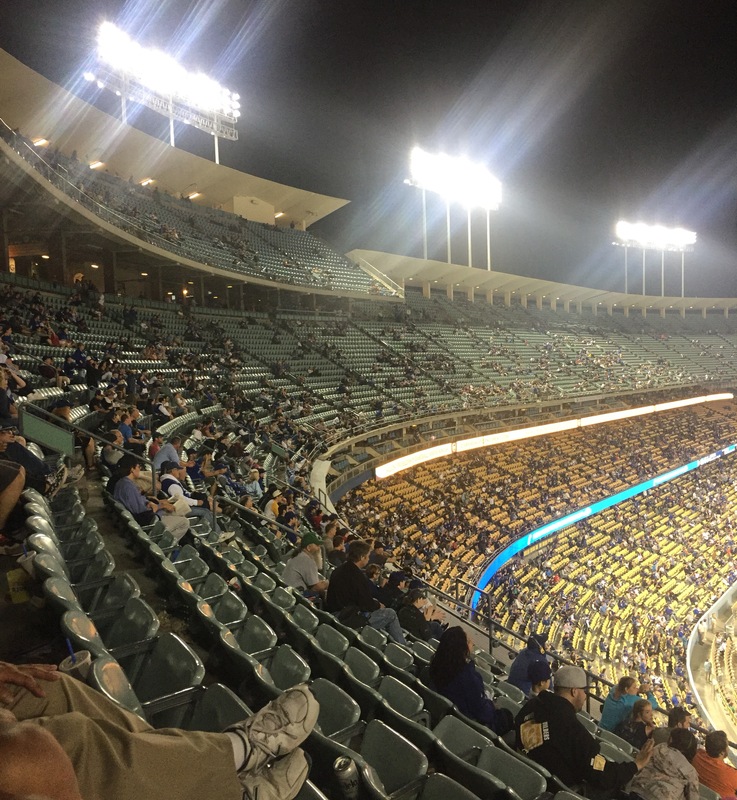 My friend Jihane’s first Dodger game ever. And most importantly, thanks to the magic of Twitter, I was able to bask in the glory of my first Nacho AND Ice Cream Helmets of 2016. For the record: When we arrived at the stadium, Nacho Helmet was leading 53 – 47%. Exhibit A for the perfect outdoor Sunday brunch. However, I had a hunch that a tie could happen by the time the poll closed so I decided I’d to cover my bases. Exhibit B for the perfect outdoor Sunday brunch. 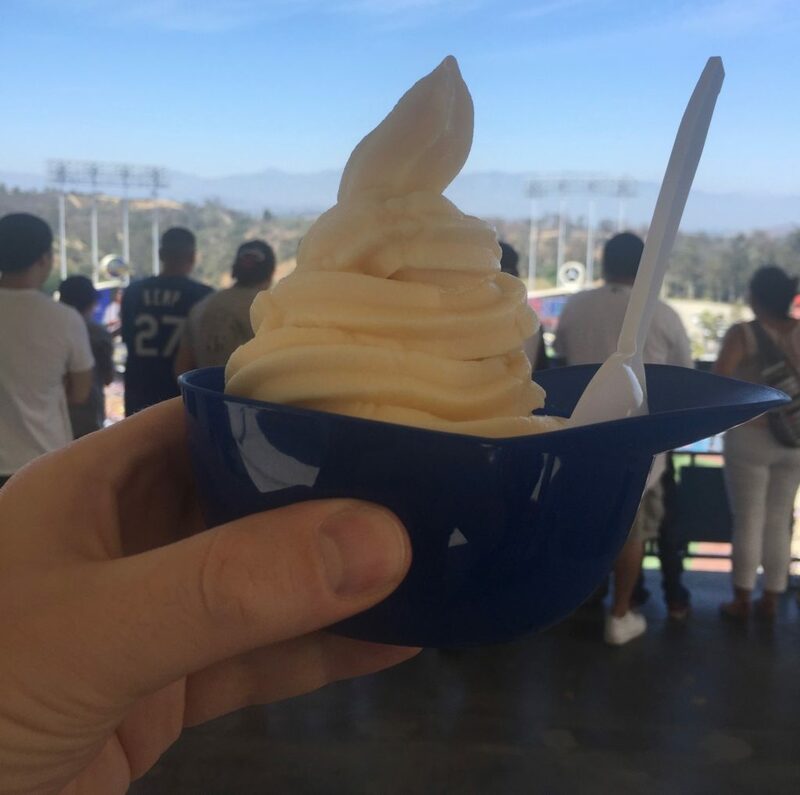 Ice cream always tastes a little better when it’s served in a miniature helmet. As for the game itself, the Braves got on the board in the top of the first and held their lead for all of two outs. 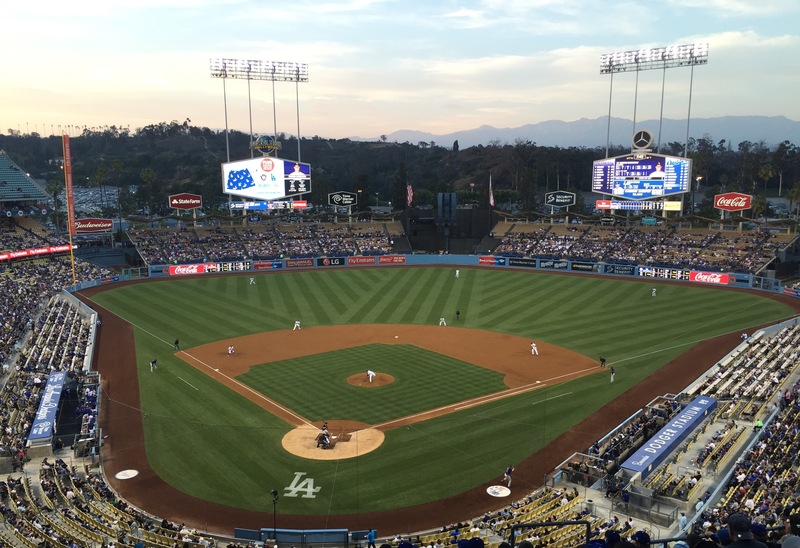 Back-to-back doubles by Adrian Gonzalez and Howie Kendrick in the bottom half of the first evened the score. Kiké Hernandez gave the Dodgers the lead for good when he led off the second with his fourth home run of the season. An inning later, the rout was on thanks to a three run shot from Yasmani Grandal. 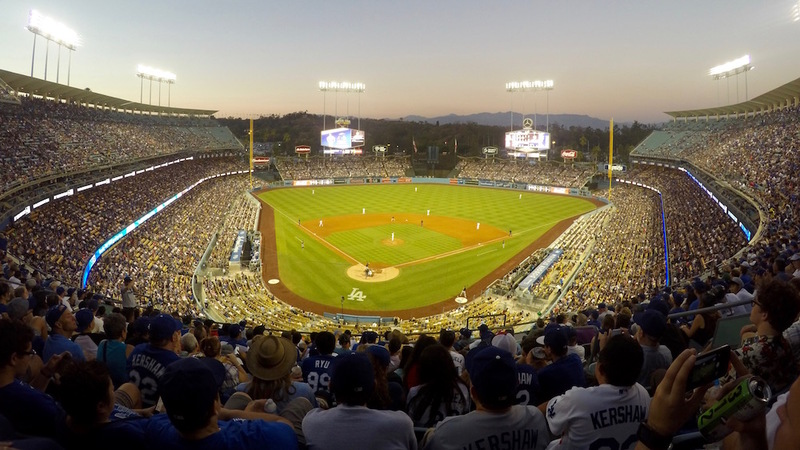 The scoring would continue throughout the game as Corey Seager belted a pair of home runs, giving him five for the weekend. 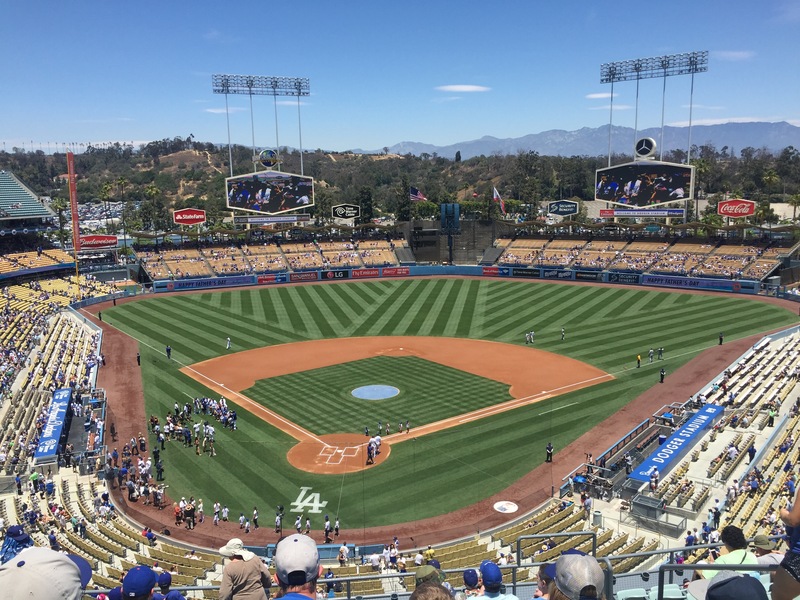 With the Dodgers running like a well-oiled machine, Jihane and I ventured out from our shade protected spot and took a little walking tour around the stadium that spanned from the Top Deck down to the Field Level. We made it back to our seats in time to belt out Take Me Out to the Ballgame and watch the Dodger Bullpen give the Braves a glimmer of hope that they could get back in the game. 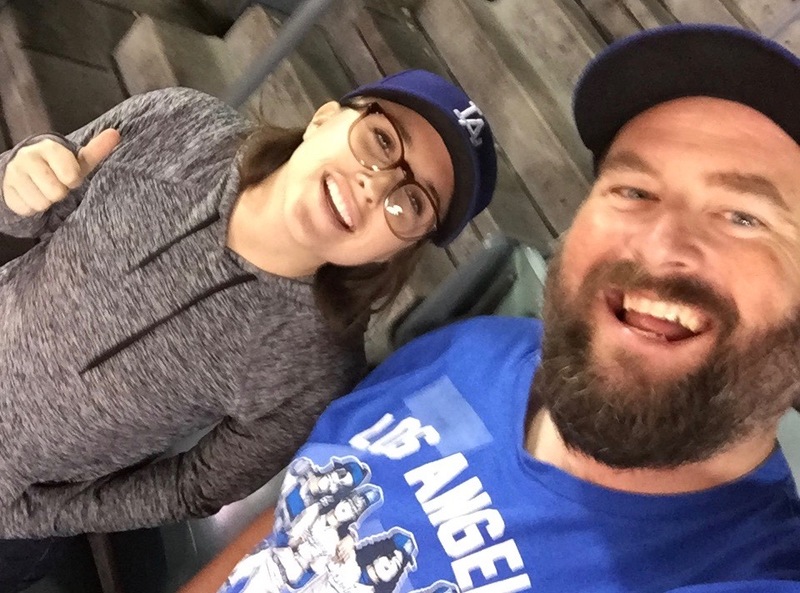 Jihane and I taking a break from the Dodgers’ scoring explosion on the Top Deck. 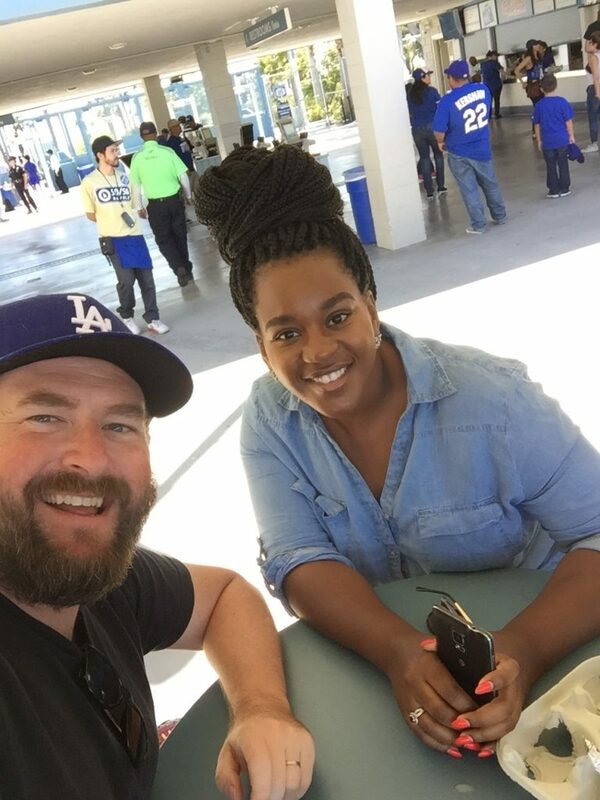 We went up there so she could snag a “First Time at Dodger Stadium” certificate at the Fan Services window. 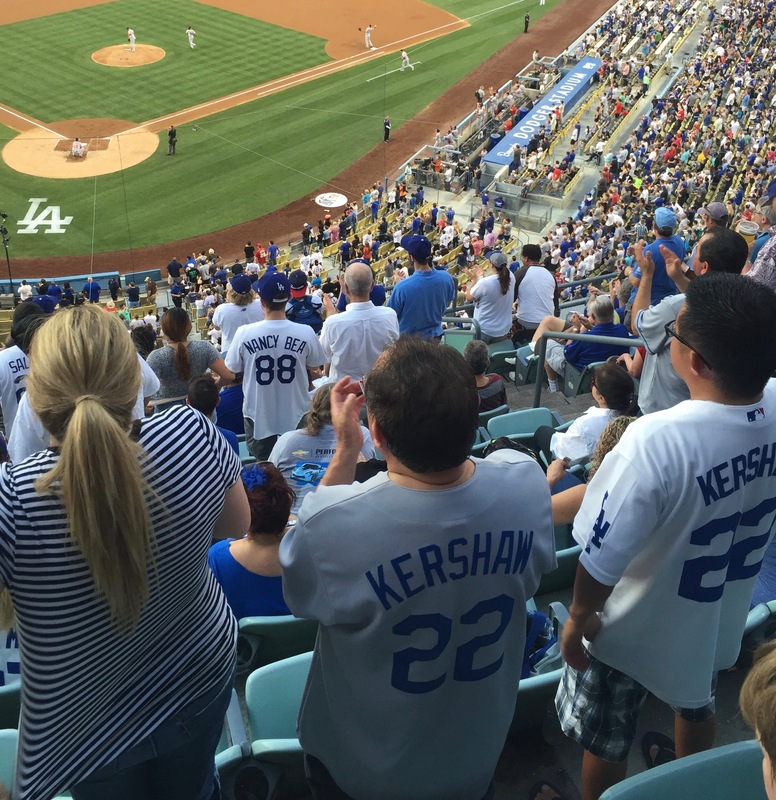 You couldn’t ask for a better first Dodger experience. Well, technically, I guess you could ask for a better game but Clayton Kershaw no-hitters don’t exactly grow on trees. Plus, the overwhelming lack of drama made for a very chill and stress-free day at the ballpark. Just the way a Sunday should be. Special Guest(s): Us! Our friend Marc invited us to enjoy the spoils of some tickets that he won. 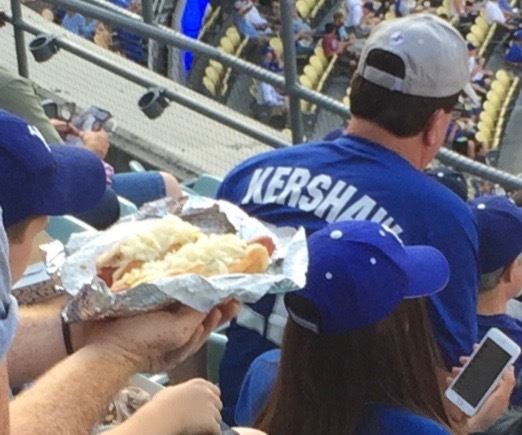 Snacks: Dodger Dog (x2), Dodger Blonde Ale, Souvenir sized Coke. Giveaway: Don Sutton retired number pin. Memorable Moment: Since it was just another ho-hum scoreless Clayton Kershaw outing, we’ll go with seeing a brilliantly executed squeeze play. 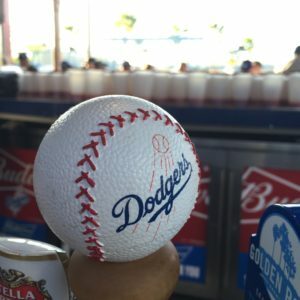 The Dodgers Blonde Ale is can be found at the bar next to the Left Field Pavilion. 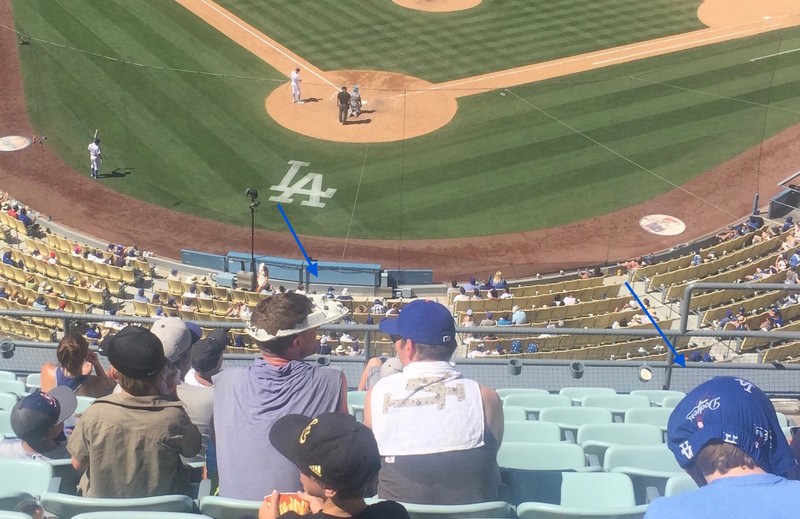 RECAP: Barely a week after I won a major award through the new Dodger Pride Rewards in-game drawings, our friend Marc, who sits in front of us up in Section 2, hit a jackpot of his own in the form of Field Level tickets. My wife and I joined him along with our mutual friend Leslie for a night down in the Larry King adjacent seats. 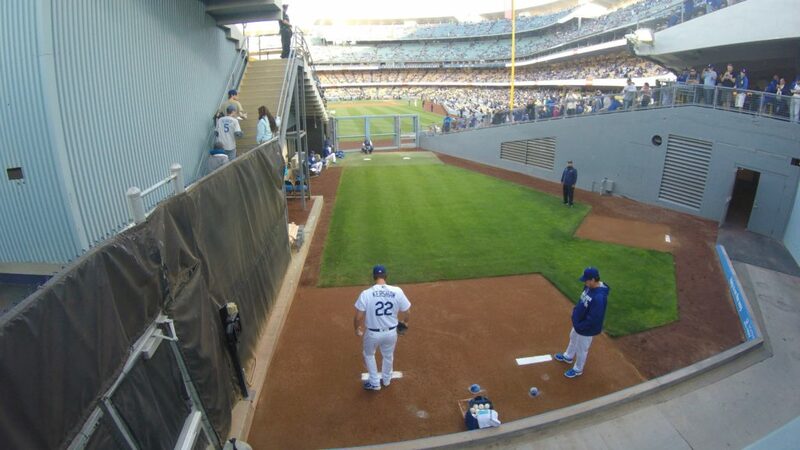 With Clayton Kershaw on the mound, we met up extra early to snag seats above the Bullpen Overlook. 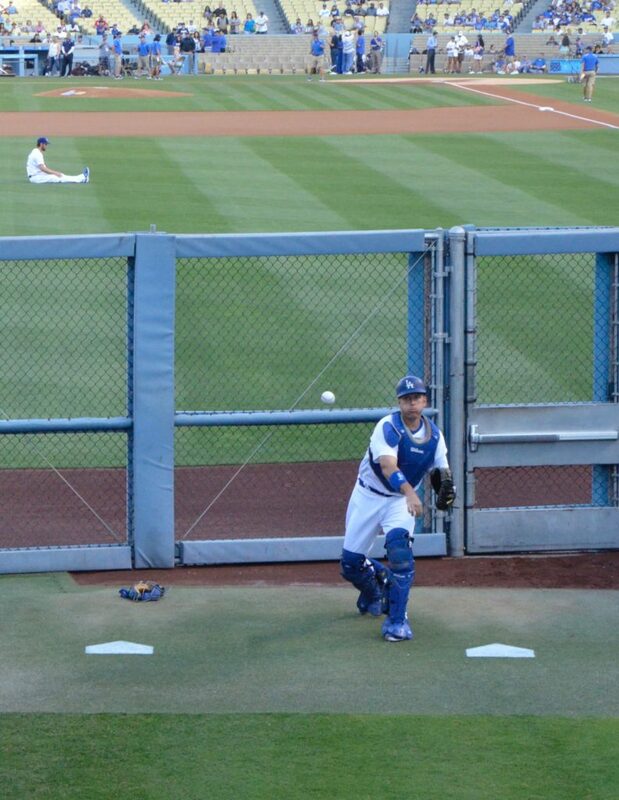 Like always, it was well worth the wait watch him warm up. A.J. 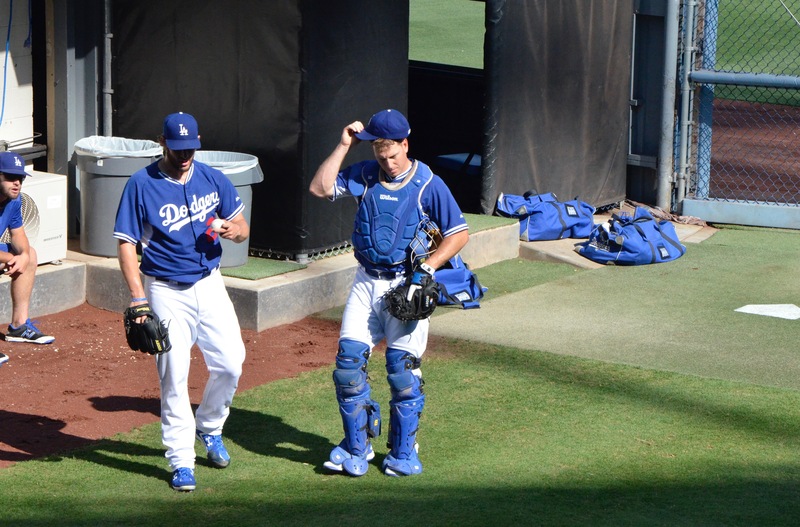 Ellis gets loose while Clayton thinks deep thoughts about all the ways he’ll mow down the Braves. 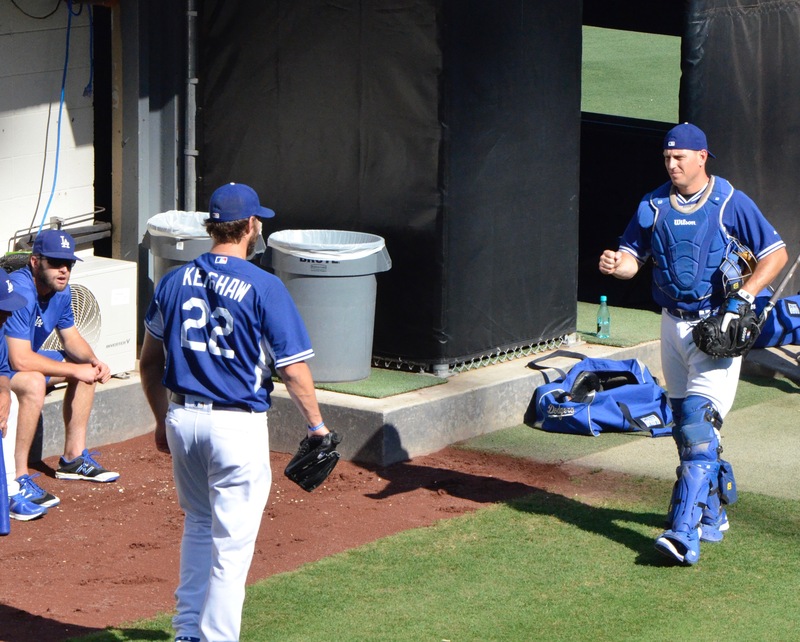 Clayton and A.J. 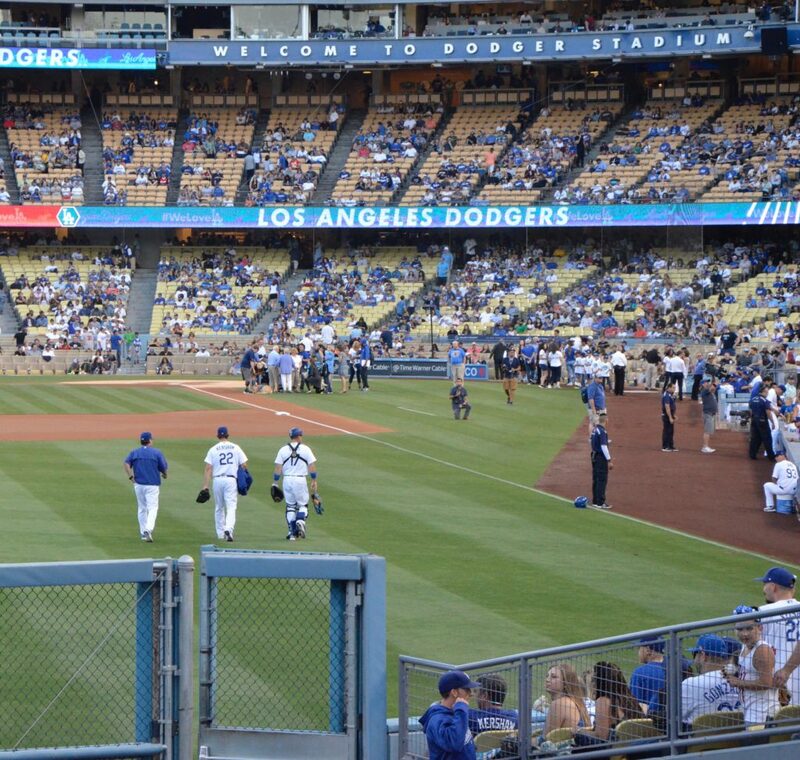 make the walk to the Dodger dugout. 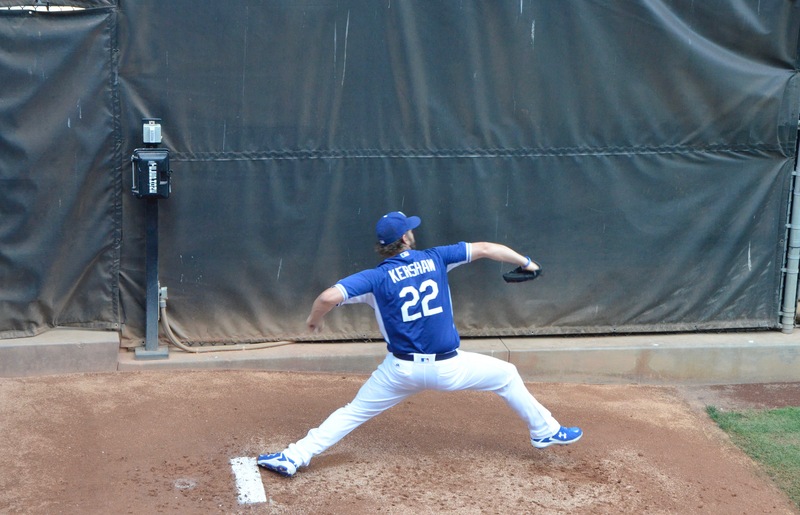 Clayton Kershaw lowered his ERA to 1.46 after throwing six scoreless innings. The first big dramatic moment of the game came in the top of the second when first base umpire Joe West, yes, that Joe West, called a rather iffy balk on Kershaw to send Jeff Francoeur to second base with nobody out. Once the steam stopped shooting out of his ears, Clayton responded by throwing a pair of strikeouts and inducing a ground out to end the threat. The Braves would get a runner to third the following inning but that would as close as they’d get to putting a run on the board the entire evening. On the Dodger side of things, Clayton (of course) gave himself all the lead he needed in bottom of the third by knocking a single to the fringe of left field and then hustled in from second off a Justin Turner single. One detail worth noting: Justin changed his walk up song from his long used Turn Down for What. I didn’t recognize his new jam but hopefully it gets him hitting again like the Red Dream we all know and love. 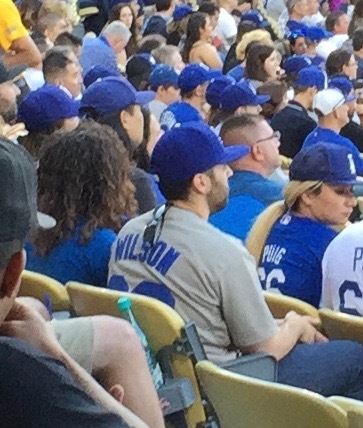 When you spot a fan wearing a Brian Wilson jersey, you gotta take a pic. 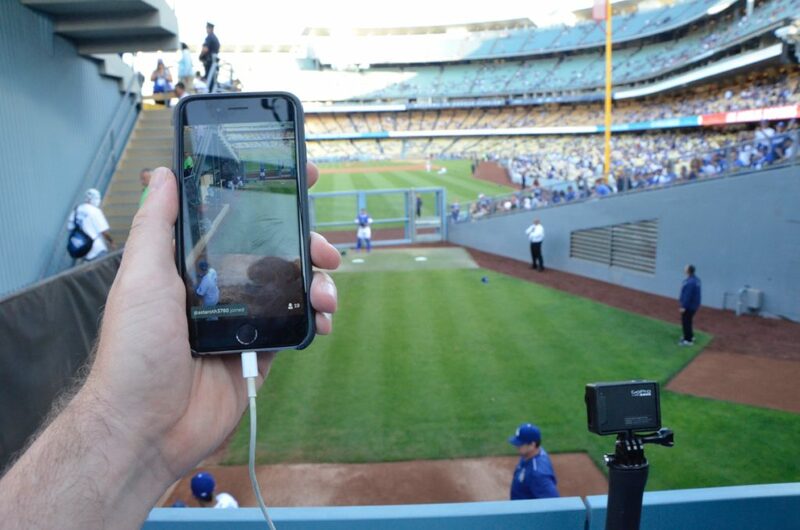 Not far from Brian Wilson’s last remaining fan was this pro selfie taker. 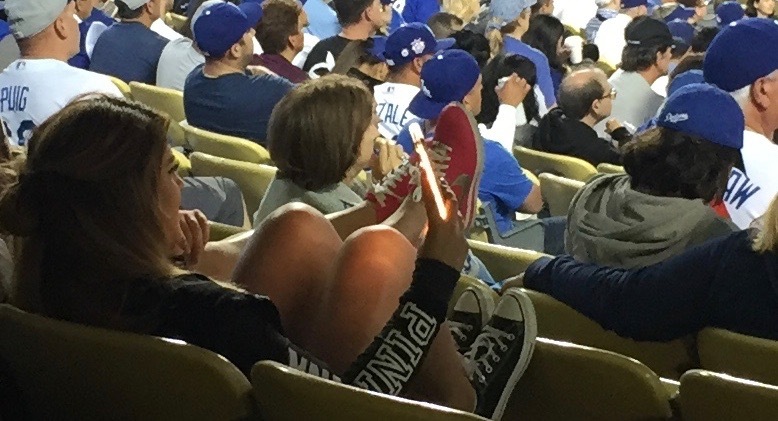 Check out the light up phone case. 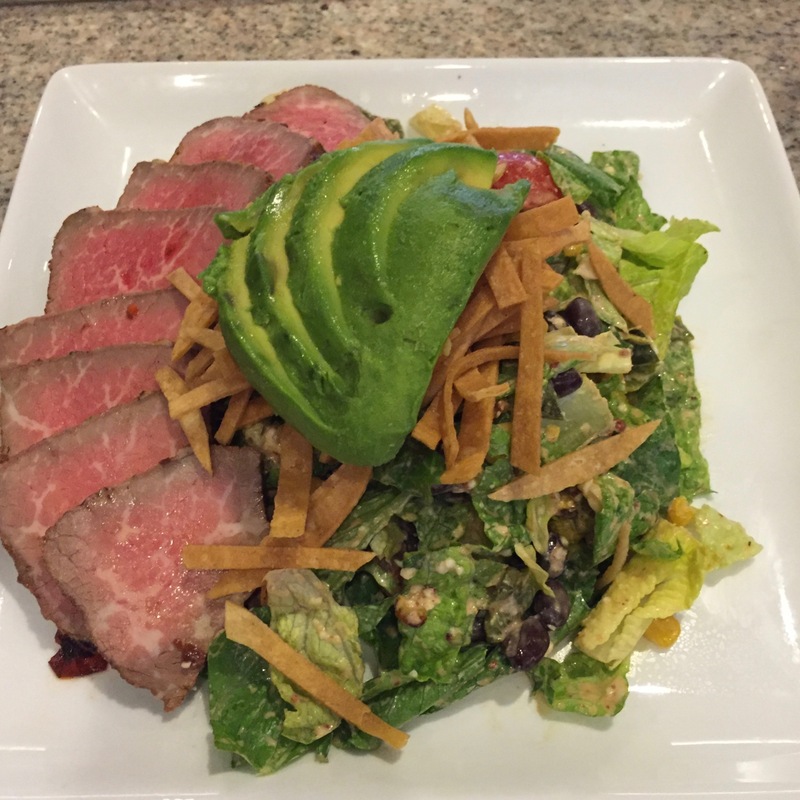 It’s Kardashian approved! 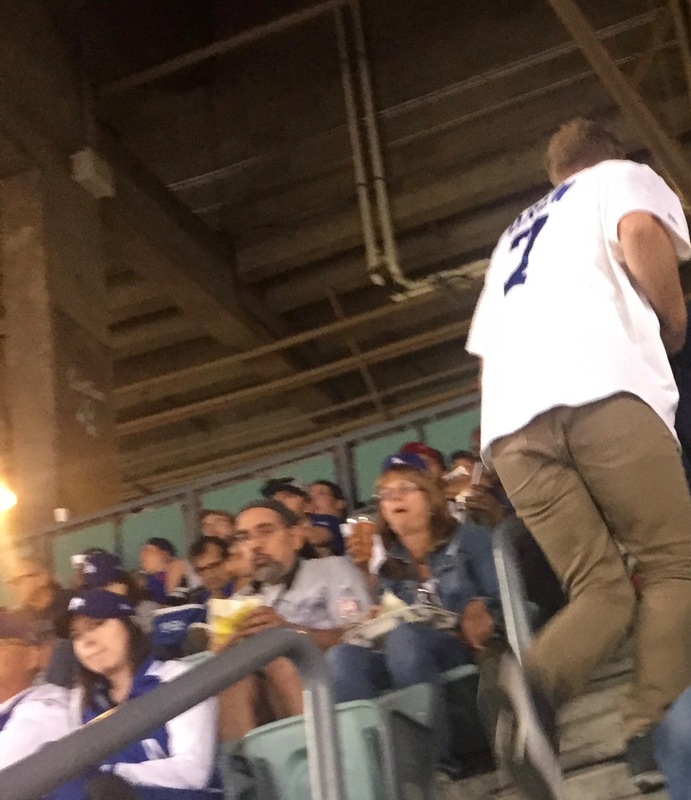 Things got a little tense when the Dodger bullpen took the wheel in the top of the seventh. Joe Blanton and Pedro Baez each gave up a hit in their respective innings but were able to bridge the gap to Kenley Jansen. In the bottom of the eighth, the Dodgers took away any potential ninth inning drama by adding a trifecta of insurance runs. With Turner and Trayce Thompson on the corners, Braves manager Brian Snitker called in Ian Krol to face Joc Pederson. 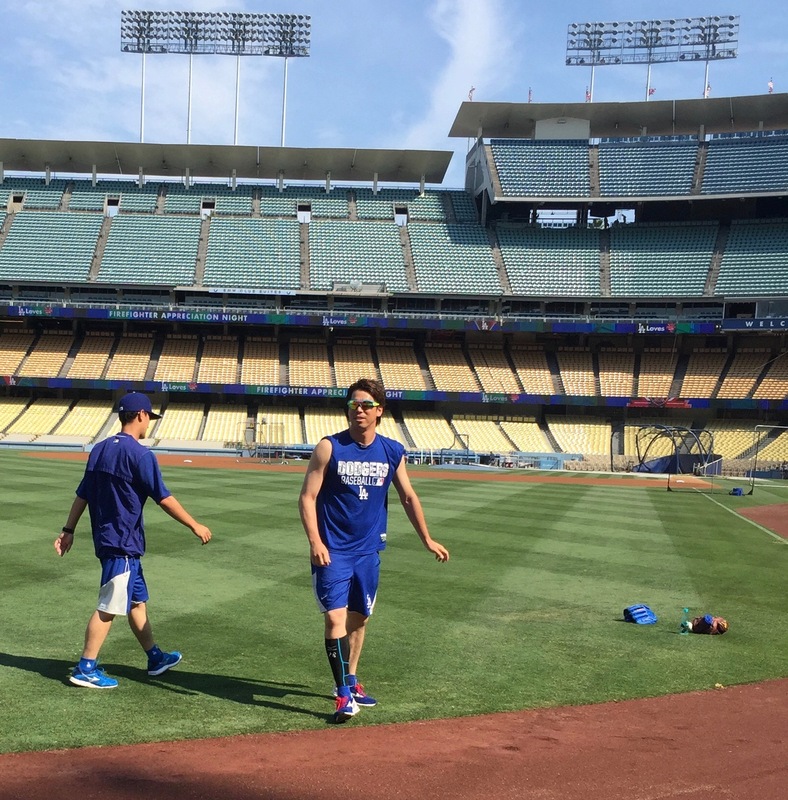 Joc laid down the first pitch he saw and it couldn’t have been a more perfect bunt, landing in the no-man’s land between the mound and second base. Turner scooted home with ease and two pitches later, Thompson and Pederson executed the Dodgers’ first double steal of the season. 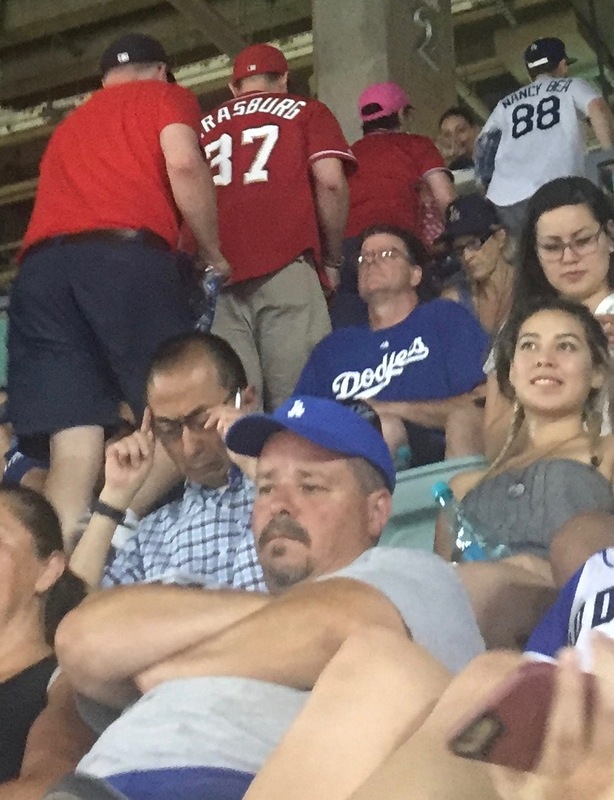 And if those offensive fireworks weren’t enough to put a Saturday night Dodger Stadium crowd into a partying mood, our section was treated to an epic lap dance late in the game. A group of ladies in the row behind us were celebrating a birthday and a fellow sitting next to my wife seized the opportunity jump over his seat to get his Magic Mike on. It just wasn’t a couple quick air humps either. The dude went for it to the howls and screams of the birthday girl’s friends and he kept on bumping and grinding her until they all snapped souvenir photos. It was such an impressive display of moves that I fished three bucks out of my pocket so I could make it sprinkle for him but my wife pumped the brakes on that. It was probably a wise decision as the sight of dollar bills likely would have had him ripping off his shirt. I just hope he’s out of the doghouse by now. The poor guy’s boyfriend was not pleased. 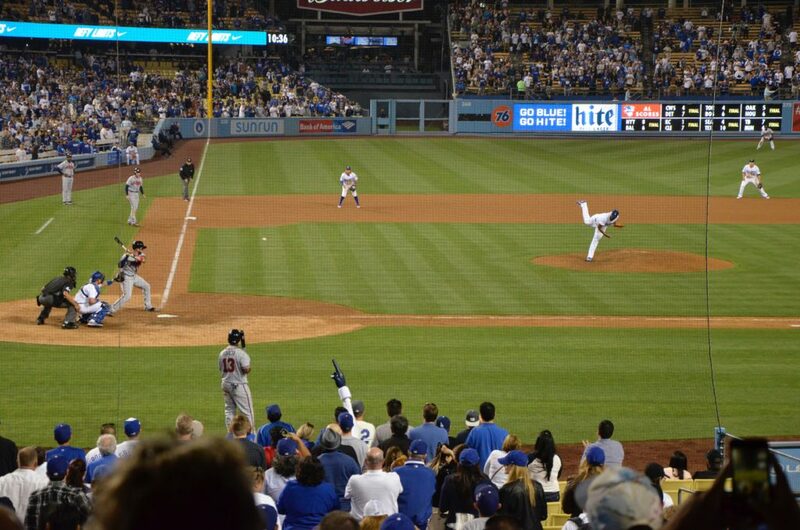 Kenley Jansen, a millisecond away from getting his 16th save of the season.